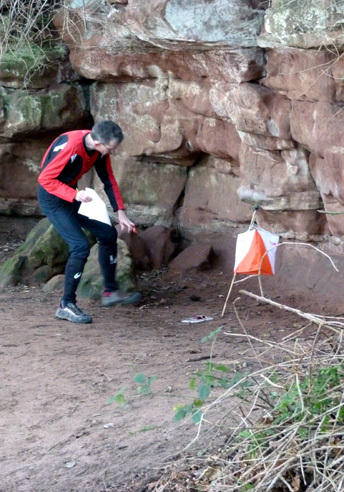 Bickerton was a classic example of score events - like planning your route backwards between controls on a normal course, your general route round a score event must end with lots of options near the end so you can trim your route to match the time left or have plent of options if you have time left. 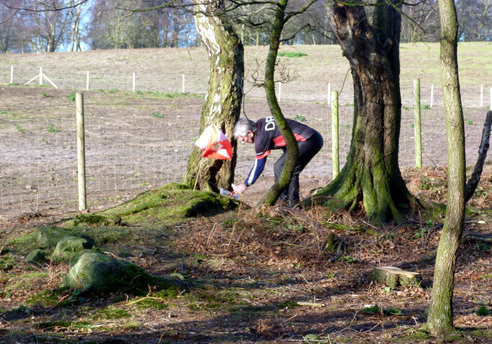 So, the best way round the Bickerton event was anti-clockwise, picking up the 3 at the bottom of the hill first so that you aren't left wondering whether you can get them all at the end of the race with a hill up to the finish. 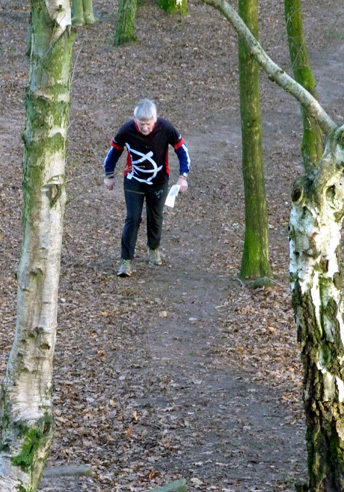 Circling round anti-clockwise leaves lots of options on the gentle slope down to the finish so you don't run out of time or of controls to get near the end. 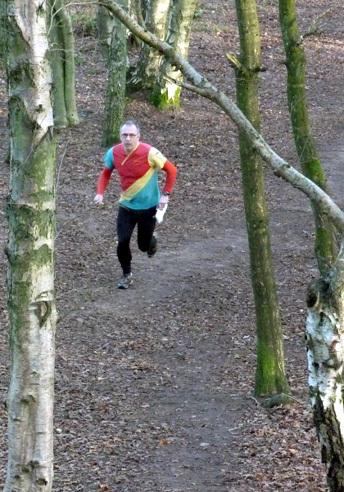 Congratulations to Dan Weaver for keeping up with Jon Hateley for 11 controls (and arriving at his 11th control as I got there having got 10) - but he must then have got confused about Hateleys as he then followed Hannah Hateley back to the finish - or had he run out of steam? Quite amusing to watch those 3 on Routegadget animation. 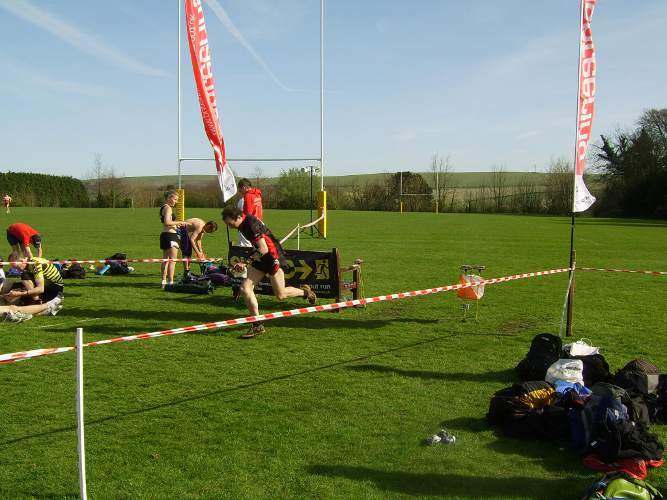 Should a junior worry about running clockwise or anti-clockwise on a score event like this? No! My strategy was to pick the brightest-coloured adult and follow. Simples. I also chose to leave the chickens behind. Where was the vegetarian option? It was a bit mean that Jon stole my present though. 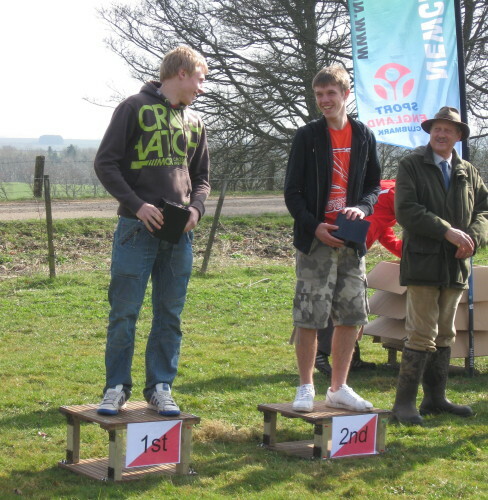 Last year I won due to my wellie throwing expertise. 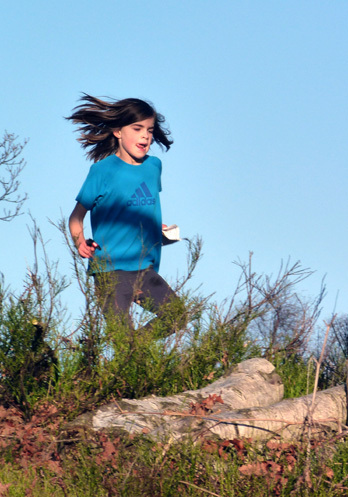 I was under strict orders from my parents not to win this year, so I jogged back with Hannah. 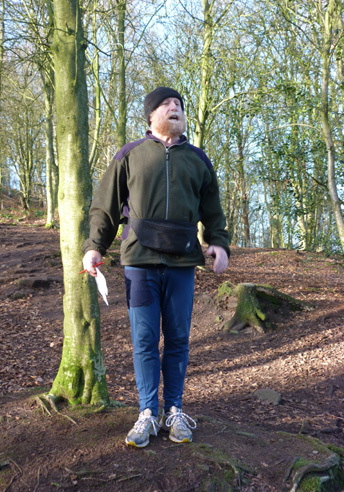 I thought Jon was looking tired anyway, probably due to carrying my present up the big hill. Photo gallery by Robin Tilston - contact Robin if you would like a higher-quality copy of any photos. Thank you for your efforts yesterday. However I feel the whole event was somewhat tarnished by simple zoological ignorance. We were clearly informed in the pre-event briefing to look out for bonus turkeys (Meleagris gallopavo var. rubberensis), yet the forest had been populated by a different species altogether (Gallus gallus domesticus var. vulcaniso). I ran past and ignored at least 3 chickens at controls, assuming they were unrelated to the event, or were at best decoys. If we had been properly briefed, I would have benefited from an extra 135 points and comfortably won the event. This is a most unfortunate, but inevitable, result of having a physicist run the club! The Chairman will be convening a jury to consider this protest, and in due course to pronounce a guilty verdict on the protestor. A jury chaired by Mr E Lear was convened to investigate allegations of fowl play and ornithological ignorance by the planner of the 2011 Turkey Trot. Its feathered experts met to examine all the evidence. It is reported that proceedings were very noisy with much clucking, gobbling and hooting. 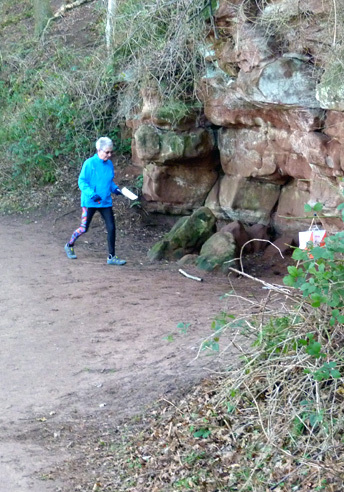 A decision was rushed through by the wise old spokes-owl - who it is thought to had to leave urgently, with his feline friend, on a voyage of a year and a day for an important rendezvous in December 2012 with a turkey... on Bickerton Hill. We are able to report that the Jury upheld the objection of the complainant, a Mr Infuriated of Delamere. The jury concluded that chickens, not turkeys, were indeed present during the competition. Referring to Appendix W section 73.5.8 of British Orienteering Rules, governing the points bonus to be awarded for collecting rubber poultry at informal festive level D score events: chickens should carry a bonus of 107 points rather than the 45 awarded for a turkey. The results will be adjusted accordingly. It should be noted that this will affect the podium positions of the competition, and that Steve Ingleby will now replace Jon Hateley in 3rd position. 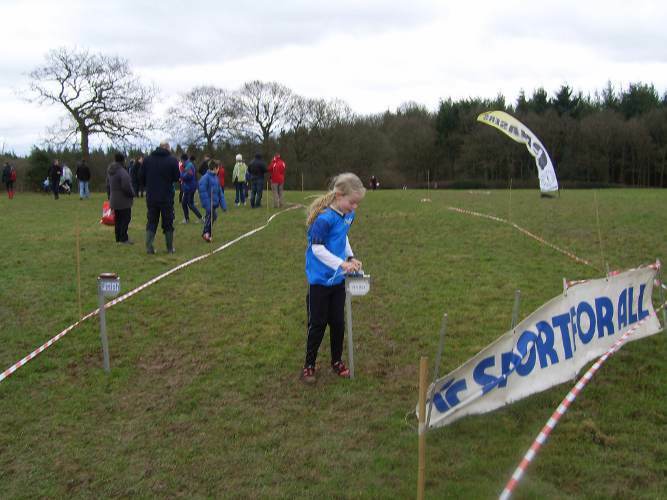 A small band of Deesiders had a great time putting on two orienteering courses for Decathlon UK at the Family Adventure Day on Saturday 10 December to help celebrate the opening of their new store in Warrington. 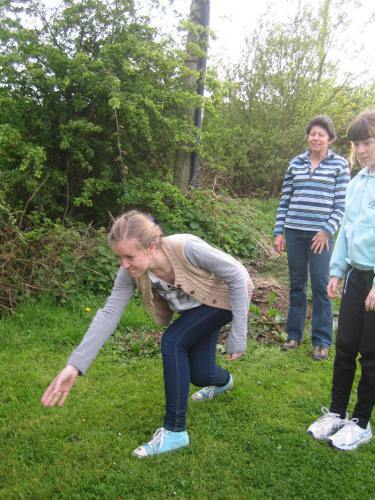 In addition to orienteering, there were great demos of stunt biking and the opportunity to try out a snowboard simulator, a climbing wall, bocking, slacklining and even riding on a horse simulator called Bob. [Neeeigh - Ed.] 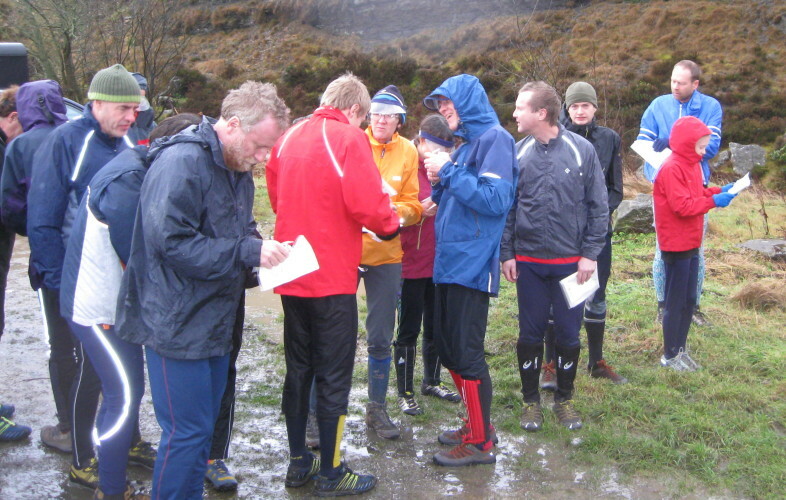 Despite the damp, chilly weather 106 runs were recorded on Pete Owen's 5x4 grid courses with most participants electing to try out the easy course and then progress to the tricky hard course with its many changes of direction. Deesiders who unofficially ran the hard course to keep warm finished with their reputations intact recording the fastest times of the day - phew! 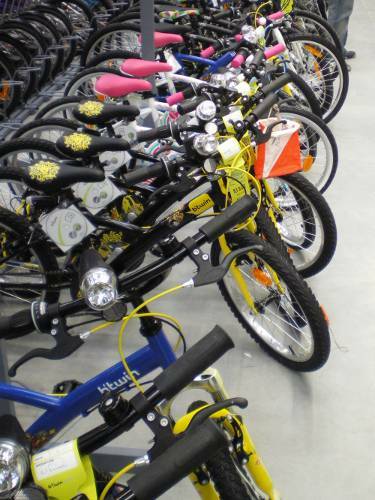 Meanwhile, 128 "runs" (participants walked) were completed around the course set up inside the store by Jane Mockford. 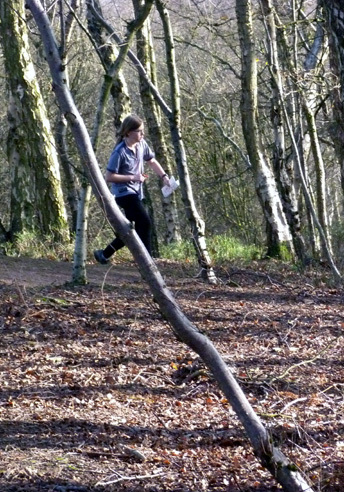 Many families took part and we think that altogether some 260-300 individuals had a go at orienteering during the day. One lucky participant drawn at random from the completed control cards will receive a £100 Decathlon voucher to spend in the store. 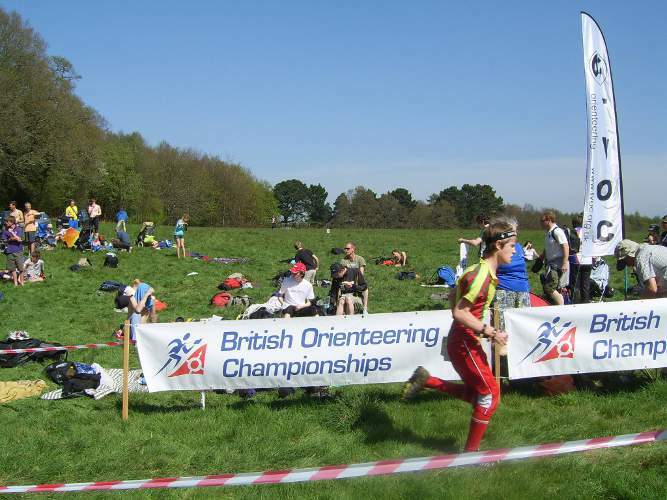 Other were able to take away some O-freebies kindly provided by our colleagues at British Orienteering plus spot prizes of free run vouchers for a Deeside event. 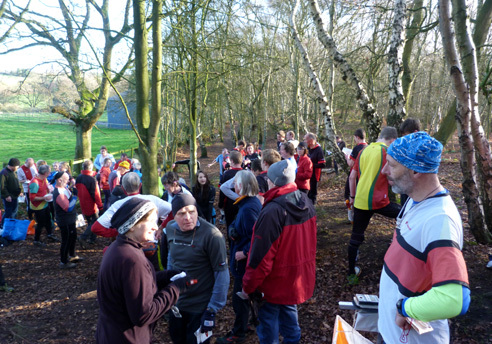 We hope to see some of them at our next event at Speke Hall on 21 January. 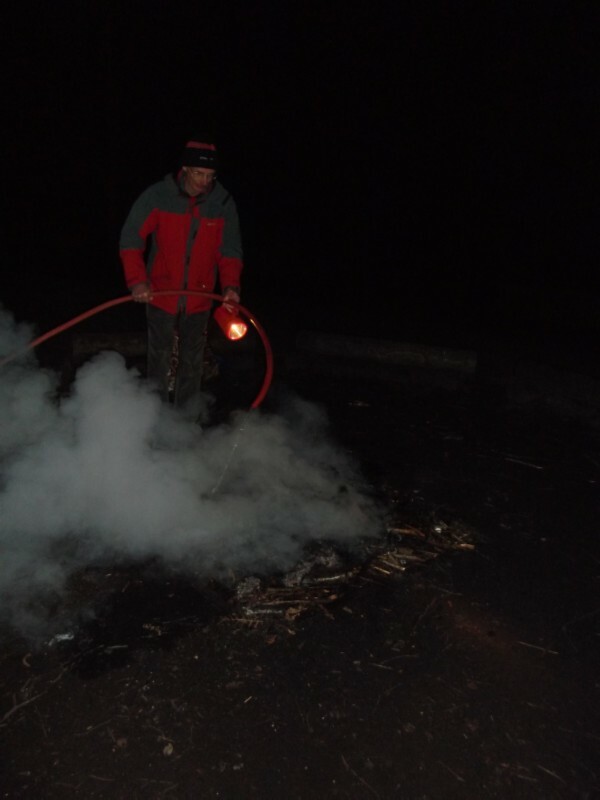 Thanks to Mike and Pauline, Steve and Kate, Nigel and Jenny, Meg and Pete, Ed, Bob, Rick and BJ for their help. Dare we suspect that Jon has finally bought decent lamps for the rest of the family? Our legal department have advised us that we have no alternative but to publish the following email which we have received from Mr Hateley. I have just read your remark (or a remark that I can probably attribute to you) that I, and probably the rest of my family if they could be bothered to read it, find extremely offensive. The implication is that I may be attempting to 'buy' high positions for my family in the prestigious NW night league by forking out on flash lights (or is that flash flashlights?). I can assure you, Mr Webmaster and your entourage of equally cynical cronies, that my wife and daughter continue to use the same second-rate, clapped-out pieces of illuminating hardware that they always have! What would be the point of furnishing them with expensive Bright Bike Lights in order for them to win .... well, yet more Bright Bike Lights?! Perhaps, Mr Webmaster, you should give some serious consideration to the possibility that their vastly improved performances at Brun Valley were in fact due to them beginning to listen to what their coach is actually telling them?! Another year, another final, another top 5 finish, another breakthrough by new juniors to count for the team. 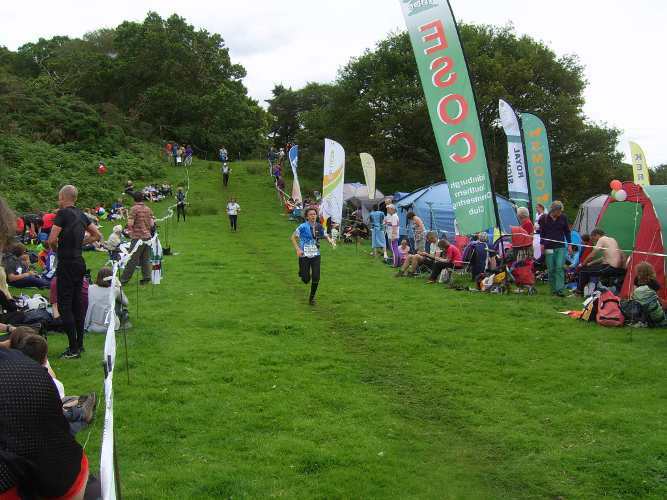 Well done to all, first of all for being keen to go and then being just enough in numbers to pip DEVON for 4th place with a better placed 10th runner - thanks to Hannah Irvine. In a heat, it's not always possible to gauge how well some will do in the higher standard of the final but Nina Jones and Isabel Hill had another pair of fine runs to finish 6th and 7th on the always competitive yellow course. 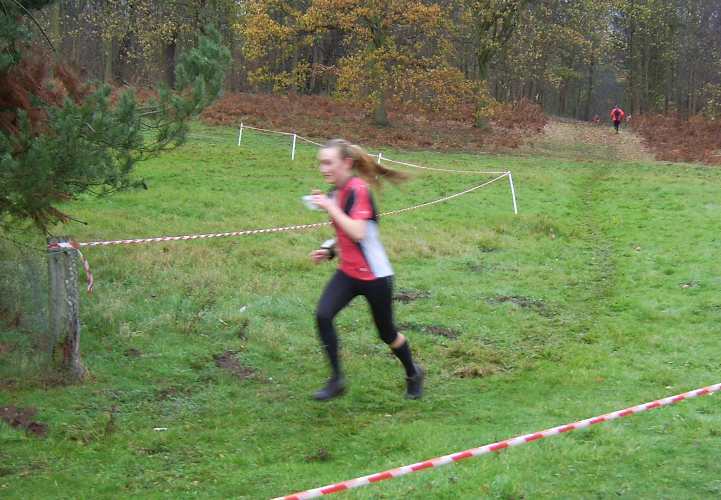 Hannah Hateley also held off strong opposition (running against not-so-good W14 and 16's) to record a great 2nd place on the orange course to be our top scorer, with Philip Vokes just behind in 3rd on light green. 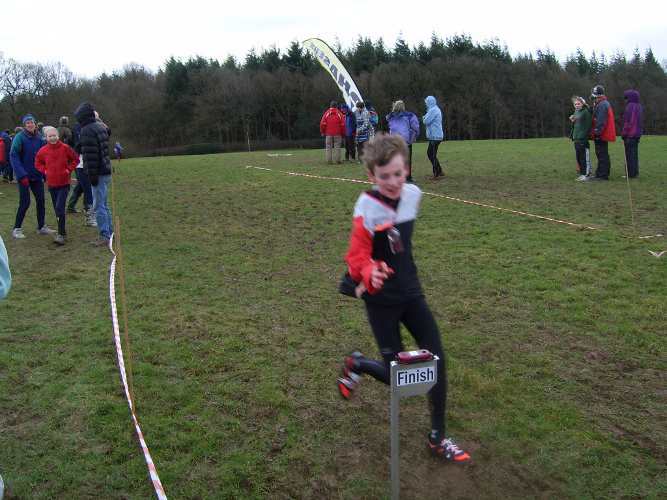 Having finished 8th in the British Schools a couple of weeks ago, Sam Baldwin repeated that on the boy's yellow course. 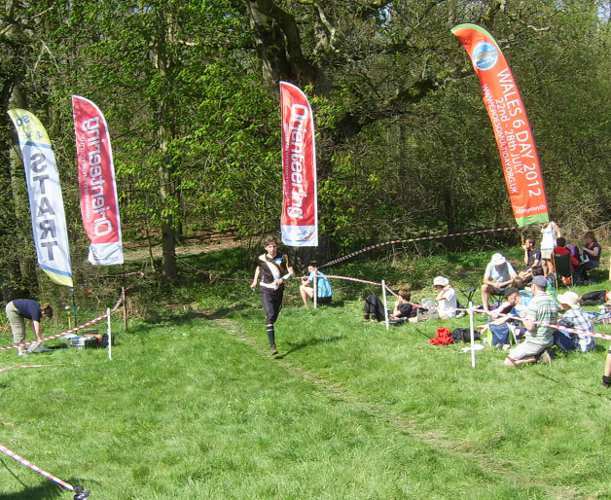 Dan Weaver and Kitty Jones were 10th and 11th on the orange and light green, and Chris Owens and Olly Williams who had a real challenge to score 6th and 11th on what seemed to be the National Champs for 16's and 18's on the green completed our top nine. 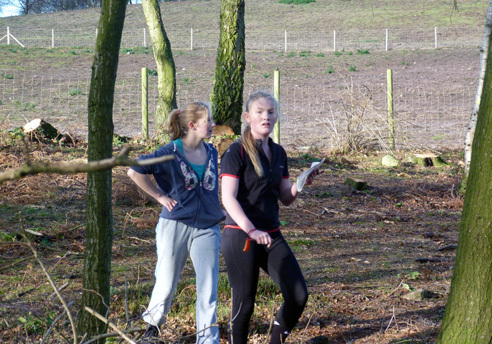 A tie with DEVON brought in the next runner where Hannah Irvine outpointed their next runner to give DEE 4th place. One difference with the heat was the incredibly runnable nature of the area where Jonny Crickmore ran 4.4mins/km to win the green course. 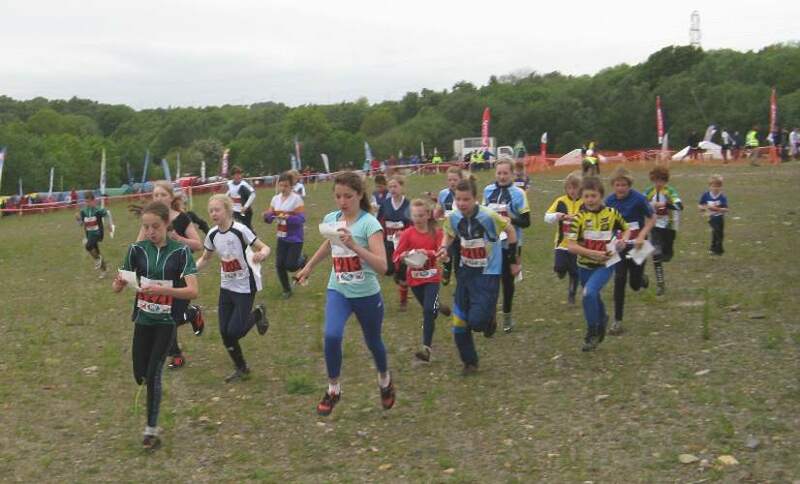 With only 13 runners this year and 10 counting, this was the smallest DEE team in a final and one of the smallest teams at the final (LOC had 33) but it seemed to be the right 13 to stay in the top 5 so well done to all. Individual and team results here. A report from Club Captain Mike Smithard. Yellow - Isabel Hill and Dan Weaver 1st, Nina Jones 2nd and Sas Jones 3rd. The final is on 4 December. For one year only, this will not be at Foxhowl. 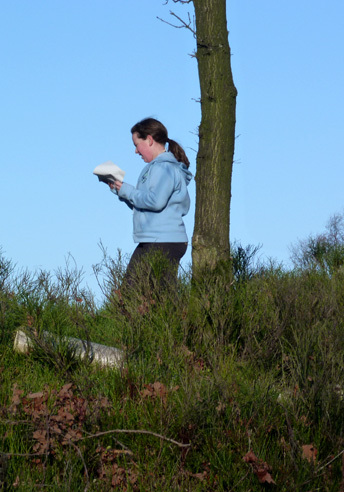 Subject to permission, it will be on the Wirral, 3-4 March. More information in the next Deeside News. Somewhere different this year - Coalport YH at Ironbridge instead of the Lakes but still linked (hopefully) to our CSC heat. They've blocked off rooms for us for 2 weeks from today for Friday and Saturday 17 and 18th February. 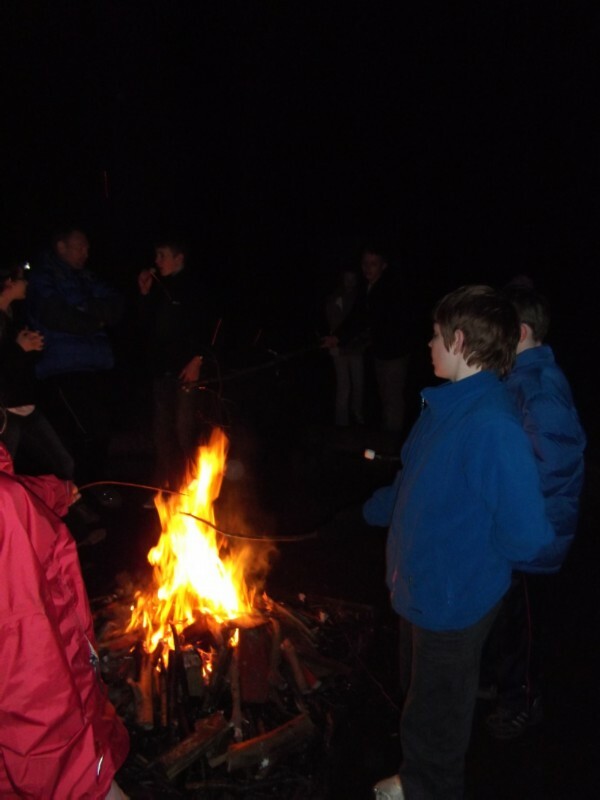 Special winter group rate of £16.95 per person half board or £19.95 full board. That's cheaper than the normal B&B rate for juniors and the bed rate for seniors. 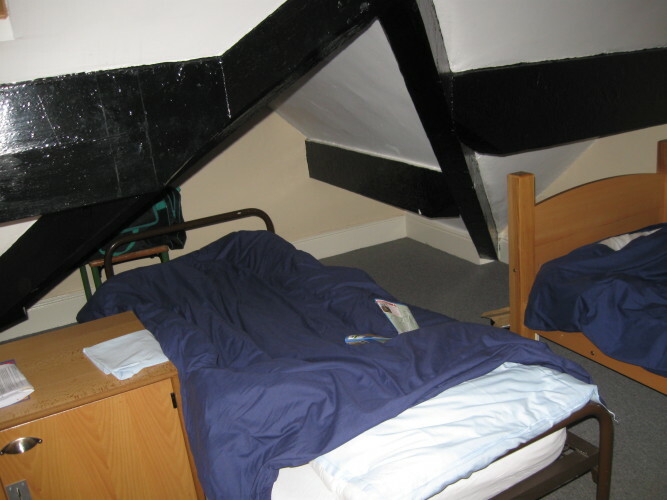 All rooms 6 bedded or less, some may be en-suite. No need to be YH members. This is at the end of half term for some (all?) schools. YH is former china works and is next door to the china museum etc. See Ironbridge website and Ironbridge museums website. Walks or runs instead of museums if you wish. Any queries or expressions of interest to Mike Smithard (smithardm@btinternet.com) with names, which nights, HB or FB asap. The Campbells (Nick and Jane) and the Paynes (Andy and Jean) are spending the next 5 days in the south of France, competing in the collection of events known as Toussaint en Provence. If you'd like an escape from cold dark England, you can follow their expoits here. Richard Tiley is retiring as North West Fixtures Secretary. Expressions of interest in the job to Sue Birkinshaw (secretary@nwoa.org.uk) by 31 December 2011. MDOC are starting a Night Street League, along the lines of the existing SROC league, with an event in Marple on 10 November. Further details of the event format are in an email sent to all MDOC members, which has also been forwarded to the DEE Yahoo Group. 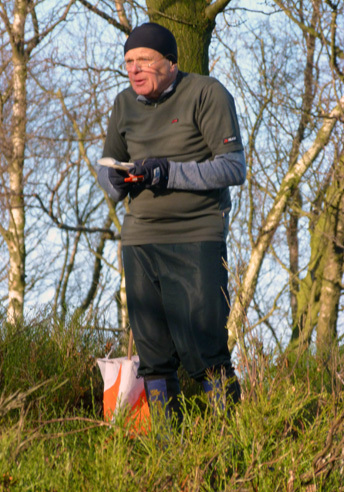 If you are interested in attending the Marple event, please ring or (preferably) email Grahame Crawshaw (grahamecrawshaw@gmail.com) - so that he can get some idea of the number of maps he needs to print, and the numbers who may wish to stay and eat. 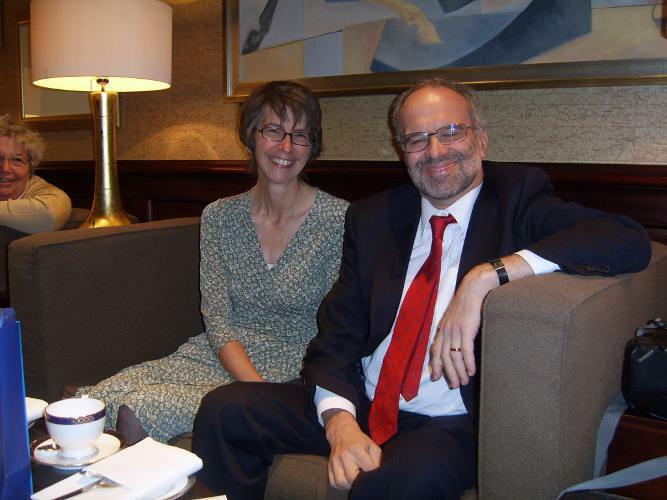 Day 1 - What are Nick and Jane looking so happy about in the Grosvenor Hotel, Chester? 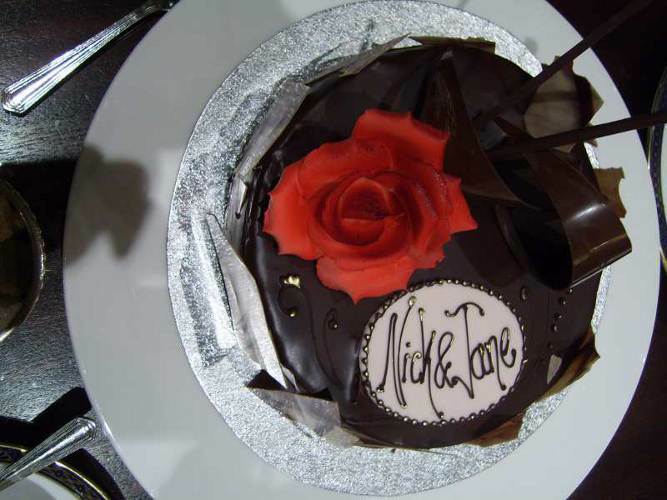 Day 2 - This photo indicates a joint celebration - have they done a 'Winner'? The first ascent of Cho Oyu in 1954? John le Carré's 80th birthday? The Surrender of Yorktown in 1781? Answers on a postcard please to Control number 30, The A Course, Chester City Races. Congratulations to Olly Williams who has been invited to join the GB Talent Squad. This squad is for "athletes who have shown the potential to progress into a successful performance athlete". 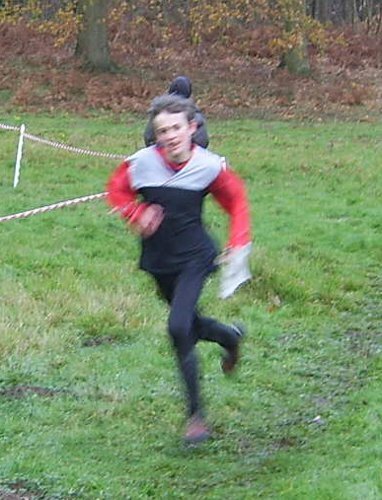 Olly celebrated by putting down the fastest times in the Reaseheath Schools event (though it may have helped that he had planned the courses) and the DEE Club Championships. Well done Olly, and we look forward to watching your progress. 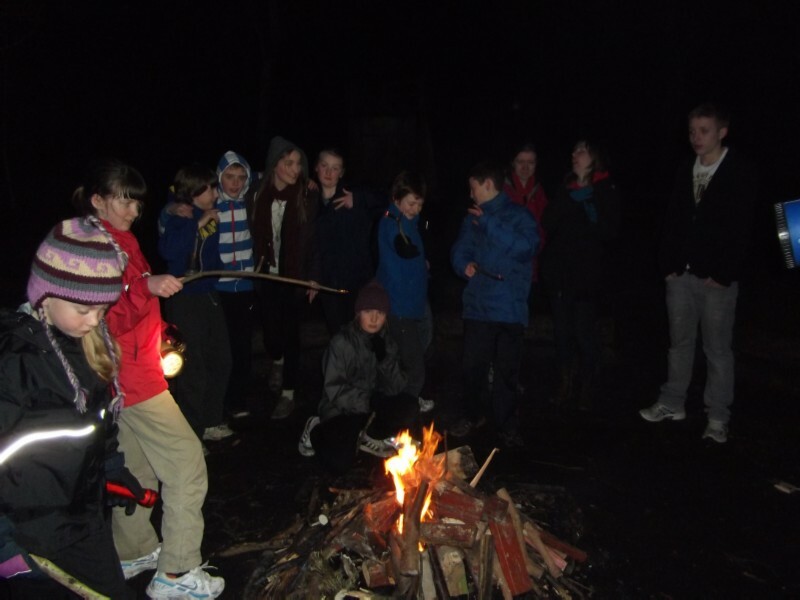 The first DEE Club Night was held at Chester Catholic High School last night. The printed North West Fixtures list for October 2011 - January 2012 was available too late for inclusion in the mailing of Deeside News 254 to members. It is available online here. Well done to all of them. Full results here. 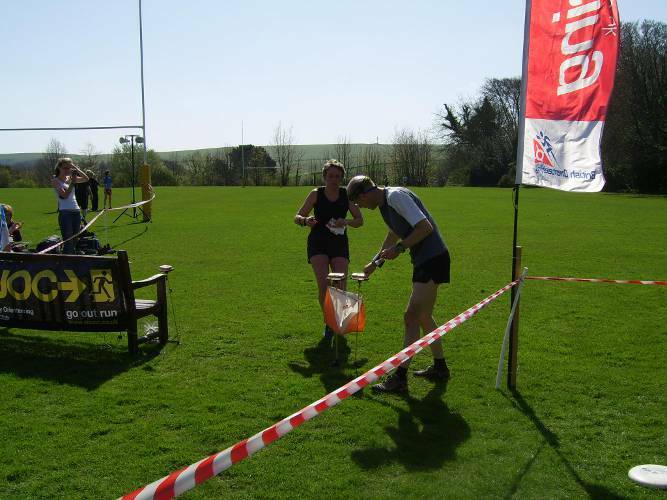 The club Annual General Meeting will be held in Rhosesmor Village Hall at 1.45 pm on 16 October 2011 following the Club Championships and social. 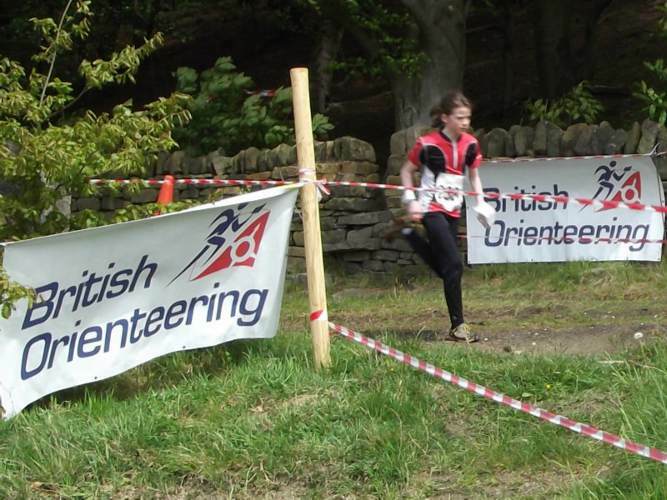 Members are cordially invited to offer themselves for the Committee positions of Secretary and NW Orienteering Association Representative. You can read the formal notice of the AGM, with the Agenda, here. Pat Spoonley is organising the social between the Club Champs & AGM and would appreciate volunteers to bring desserts - contact details in the booklet. Dee juniors were dragged kicking and screaming to a military barracks in Staffordshire for torture and interrogation this weekend. No water-boarding tactics were needed, but sleep deprivation techniques were very much in evidence. On arrival at MOD Stafford, the 12 juniors were crammed into an airless room and tormented by being given just 7 camp beds. The 3 senior club officials supervising the mad scramble that ensued delighted in the sight of larger, older boys nabbing all the beds and casting the young girls onto the floor. Boredom and attention thresholds were then stretched to the limit by subjecting the children to a 20 minute droning monologue, with repeated use of the phrase, "Do NOT mispunch!" Their anguish continued by forcing them to participate in a gruesome rôle-playing card game, featuring werewolves, witches and mysterious deaths. This continued long into the night, until even the adults were begging for release. Just in case nightmare-free sleep seemed a possibility, a series of deafening text message ring-tones were regularly sounded after midnight. At 04:00 they were dragged out of bed and forced to run around the camp grounds one after the other until exhausted. Some were wired up to an electrical supply for extra effect. To dupe them into thinking they were participating in a sporting event, they were split into two teams ... the idea being to promote inter-group rivalry and hostility. Extra treatments were reserved for two of the kids; one appeared to be running too rapidly and successfully so was unilaterally disqualified and humiliated. Another was forced to endure a loud rendition of "Happy Birthday!" 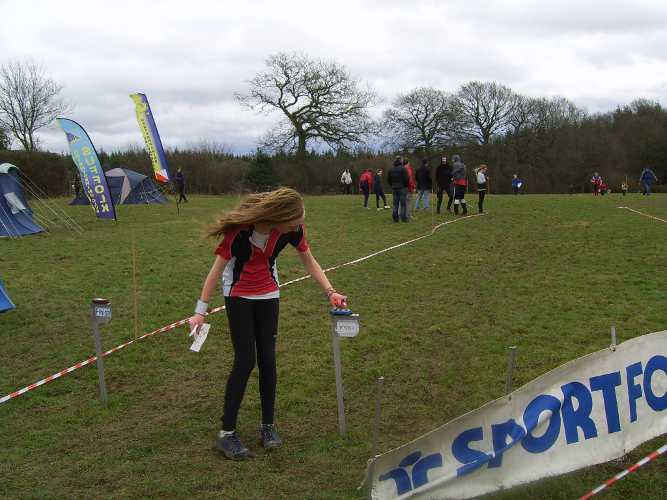 at the spectator control, causing confusion, loss of focus and an unwelcome extension to the run. 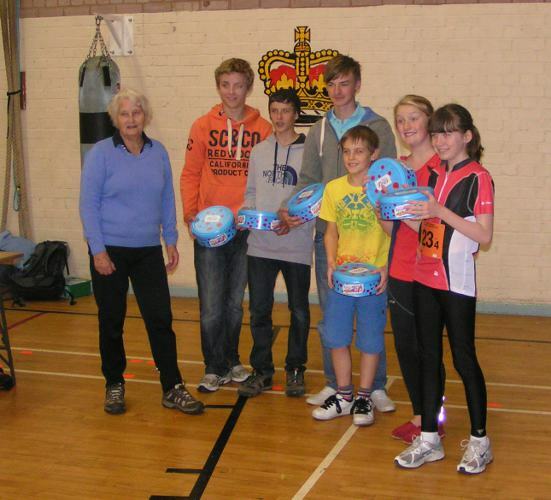 Afterwards, the juniors were cynically plied with chocolate and cake to make them all spotty, fat and unhappy. Having satisfied themselves that they were all broken in body and spirit, the adults then returned the broken husks to their homes for ritual cleansing and further debasement. 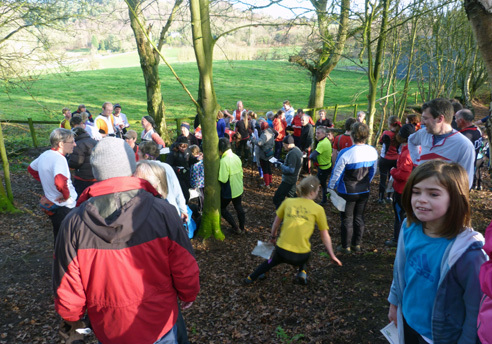 This is an inter-club junior relay event, featuring 25 teams in total, of which 8 were in the Joan George handicap class for teams whose total orienteering class ages add up to 90 or less. 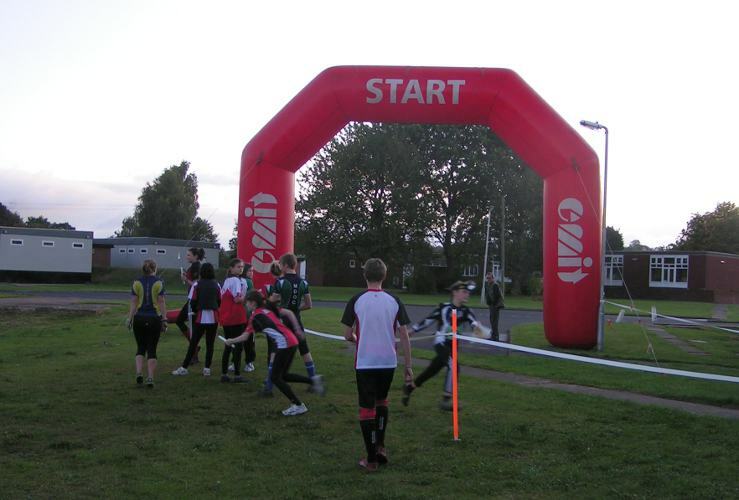 It was held at the Beacon Barracks, MOD Stafford, in a sprint type area with lots of tricky butterfly loops. 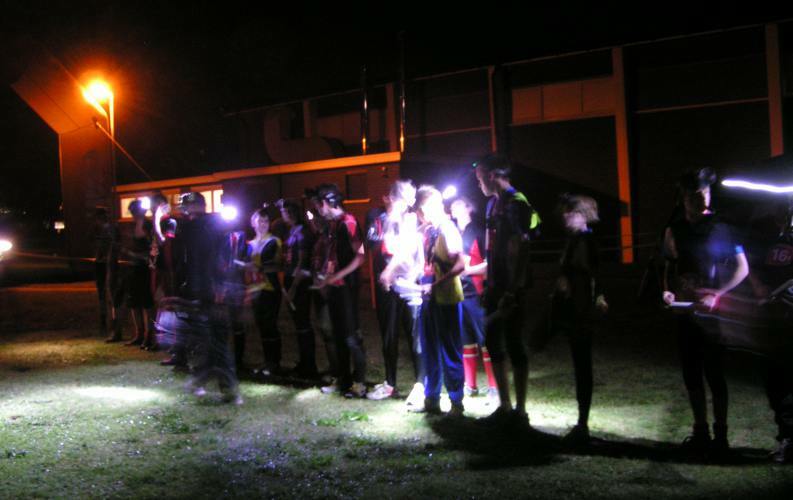 The start is at 4:45am, so the first two or three legs are run in the dark. Hard luck DEEmentors for mispunching early on [So much for the briefing - Ed]. Congratulations DEEmons on a brilliant performance to finish second in the Joan George handicap. The event was notable for Evelyn Elmes's birthday (she became a teenager on the morning of the race!! 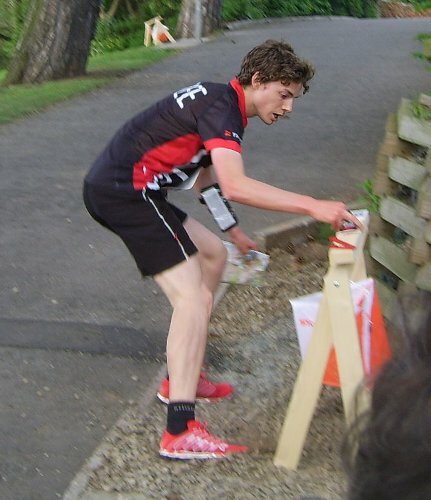 - and there was cake); and for Lachlan Chavasse's stepping in at the very last minute when brother Aidan was unwell, which also meant Sean taking on the last - and longest - leg. Well done to them all. 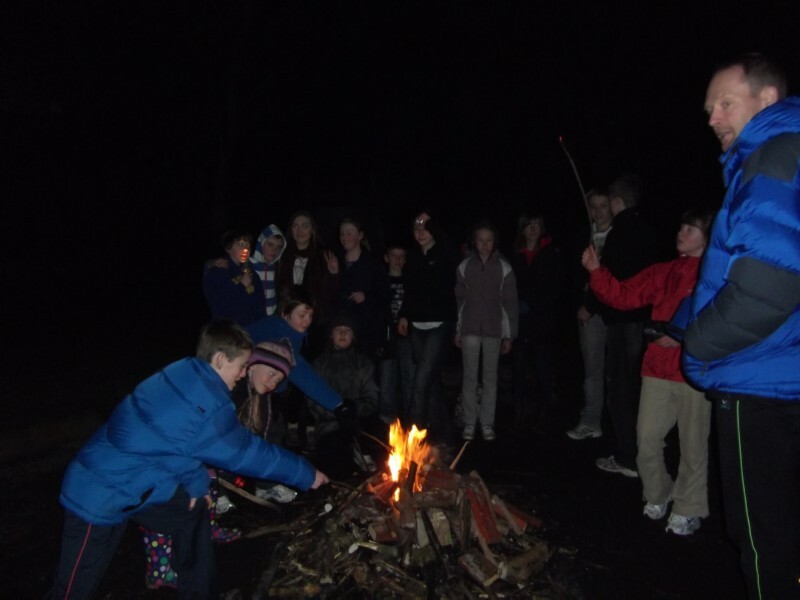 Thanks also to all the adults who provided transport, supervision and encouragement. Full results on Michael Napier's website. The teams in the Joan George handicap class are suffixed with (JG). Am I bright enough for this? A few DEE members journied across to the Pennines to take part in this year's Capricorn held by PFO at Hollingworth Lake and Blackstone Edge. 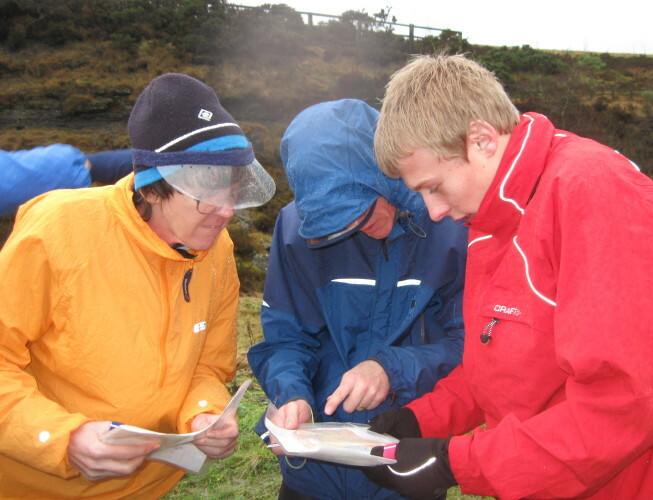 The event took in part of the previously used areas of Piethorne and Rishworth Moor, and the format was a 2-hour or 3-hour score event for individuals or teams. So well done to Darren and Elaine; hard luck Pauline for narrowly failing to beat Paul; and commiserations to Mike and Olly for over-running. If the penalties for lateness affected the 3-hour score results, they became much more significant in the 2-hour score competition, where almost half the field finished up negative. 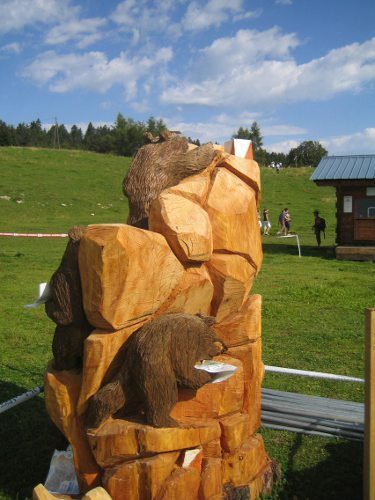 Graham Sutton lost all his points and more by being 21 minutes late; and Bob and Barbara Verity scored the highest number of points in the entire competition - but unfortunately they were for lateness. It should be pointed out that the planner, in his comments, acknowledges that the lateness penalty may need reviewing for next year, and that the 2-hour course may have been too ambitious. Full results and Planner's Comments on the PFO website. Pensby Runners are hosting a talk at Chester University on 30 September 2011 by Micah True (the central character in the book Born to Run by Christopher McDougal). Tickets are £10 each from www.caballoblanco.co.uk. 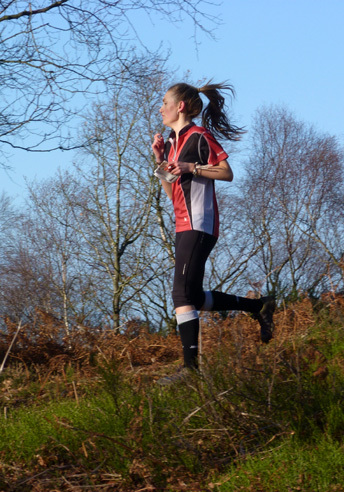 More details in the Pensby Runners flyer. 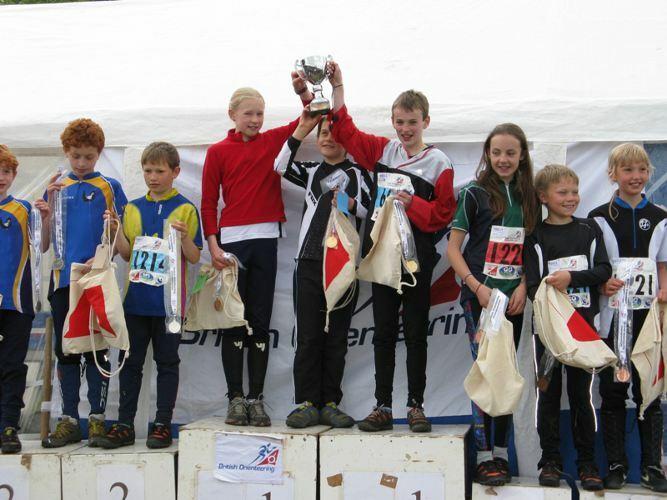 Not long ago at the BOC relays, our juniors beat off a challenge from MAR OC juniors (from Royal Deeside) to win the Mini relay. Plans are afoot to preserve this triumph next year by placing a mole or two in their vicinity - I see a certain Deesider came 2nd at an evening event up there recently and the following week another DEE member won - not only that but he is now living up there preparing a full dossier on their juniors - they have 20-30 youngsters at their events so a big pool. Meanwhile another DEE member, seeing the VHI's were in the rather rough forests up there on the other Deeside, thought he wouldn't mind if he didn't make it this year which was highly probable with Andy and Pete and Steve and John... all now in M60. However, never say never, lots of bad runs later by the aforesaid (except Steve Whitehead) and Mike S has scraped in the England team again. Now this is definitely the last time, so he's off up there in October - after all, he can see son Chris up there.......except the UK Cup final is in Yorkshire that weekend! 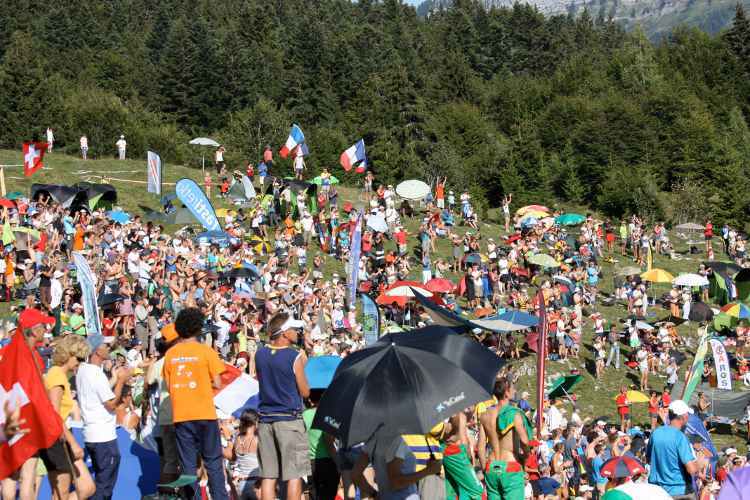 The O'Festival was run alongside WOC2011, and described as a "6-stage public event on World Championship terrains". 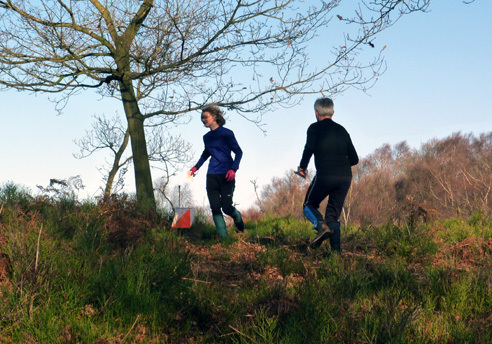 DEEsiders competing were Nick and Jane Campbell (running for their French club) and Pat Moody, Bob, Helen and Evelyn Elmes. 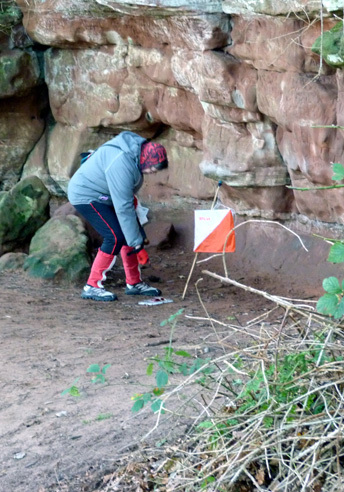 Nick and Jane had run there before, understand French orienteering, and have half an idea what they're doing, so they got on quite well throughout. The Elmes/Moody contingent had been warned that the terrain was difficult, but somehow persuaded themselves that they could handle it. 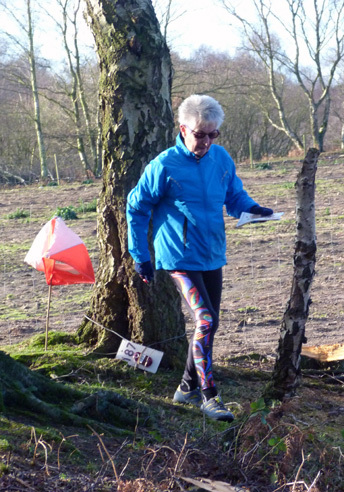 The latter's car obviously knew more about the orienteering terrain than they did, because it went on a go-slow as they approached the area. The full story of how they finished up with their own car dumped in Chambéry over a Bank Holiday weekend, and getting to the event by hire car, will be told elsewhere. Suffice to say it was not cheap. After a bit of rain in the first two days, a heatwave developed, so early starts were an advantage. 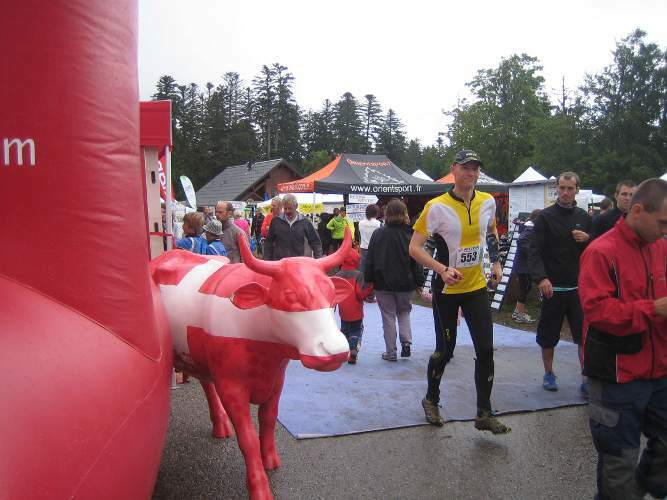 The atmosphere in the finish area (which these days seems to be called the "arena") was excellent, with technology in use for the WOC events in the afternoons including large-screen displays and GPS tracking. 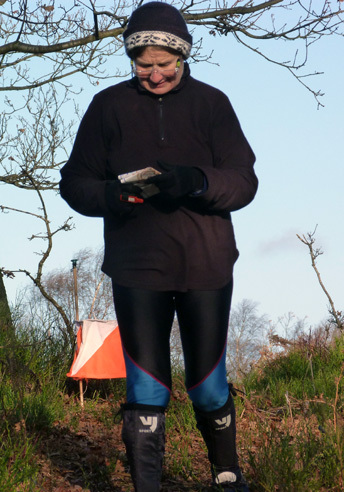 The orienteering was technically challenging - according to Trevor Roberts of MDOC "it doesn't get any harder than that". Have a look at the approaches to the first control in the Long Distance final to see just how hard some of the WOC competitors found it - no wonder Pat spent 20 minutes in and around the control circle for her first one on Day 6 without finding it, before walking the walk of shame back out through the start and heading back north on the autoroute. For Bob, a time of 77 minutes to cover 1.8km on that day sums it up - though he did spend 27 minutes of that looking for a re-entrant which turned out to be a crack between two rocks. You can see the full results, and read about the event, here. 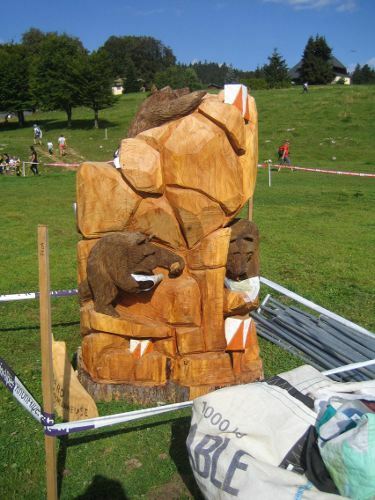 The 2015 World Champs are in Scotland (Moray Coast and Cairngorms National Park), and the Scottish 6 Days will play the same rôle as did the O'Festival this year. Definitely something to look forward to. Printed newsletter editor Jane ventures into new media with this report. 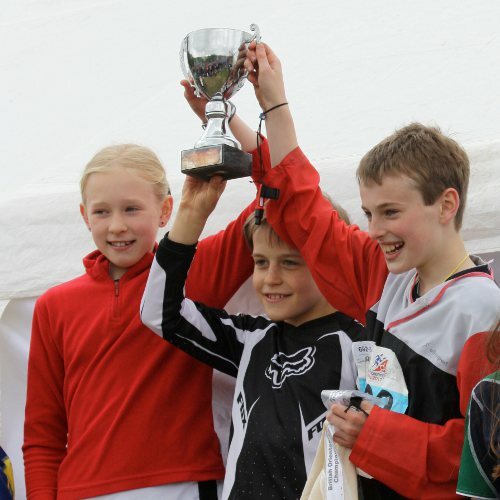 69 members made the journey north to compete in the Scottish 6 Days competition centred on Oban, joining over 3500 competitors of all ages from across the world. 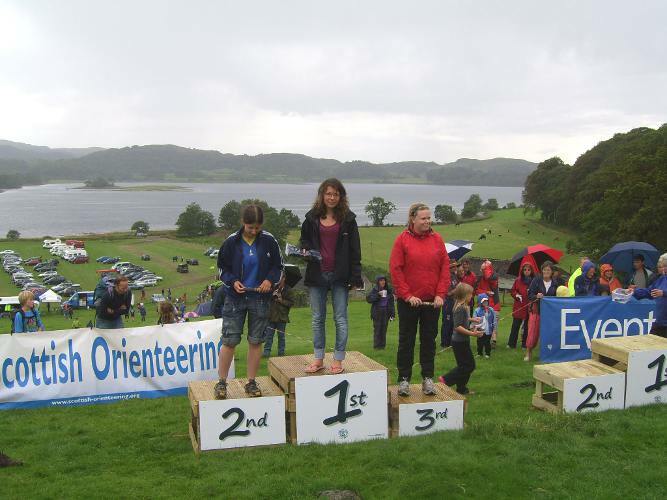 The first day's competition kicked off in Oban itself, starting on the beach around Dunollie & Dunstaffnage. 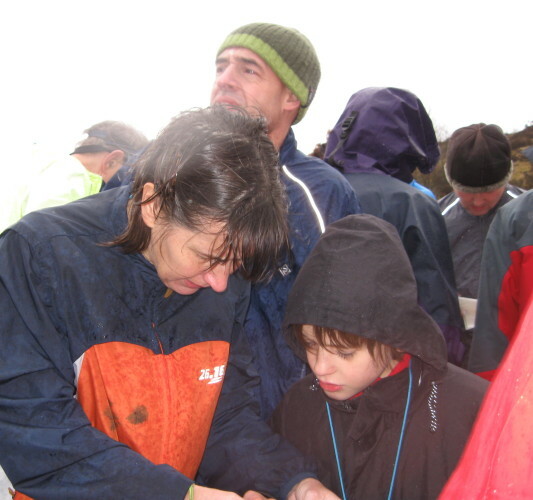 For days 2 & 3 the competition moved into the ancient native oak woods on the south shore of Loch Etive. Then after some mountain bike and sprint orienteering on the 'rest' day competitors headed into the rainy hills of Lorn, the marshy coast north of Oban and back to the north side of Loch Etive with stunning views out to Mull for the final day. Each of the 6 days of racing was a ranking event for UK runners; plus there was an overall competition across the 6 days with competitor's best 4 runs [thank goodness it was only 4 - Ed.] counting towards the final result; except that for the Elites it was all 6. 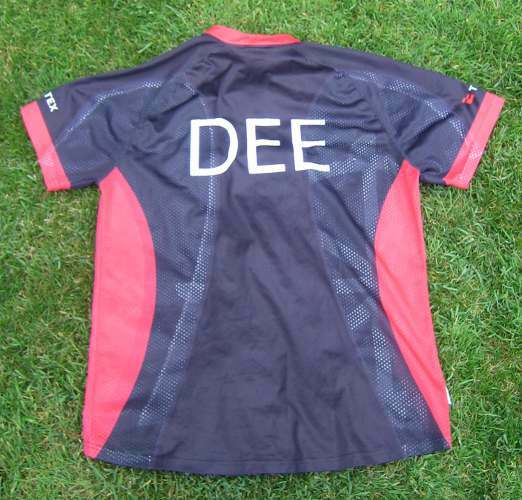 If the web editor has missed your result he apologises - just let him know (dee@elmes.demon.co.uk) and he'll fix it. A rare sight - 2 Deesiders, Dave and Chris finishing the M21E course on day 3 in a group of 4. Off 3 minutes apart, Oleg Chepelin had caught Alan Cherry who caught Chris Smithard who caught Dave Schorah and they all swept down the run-in after 14.3km. 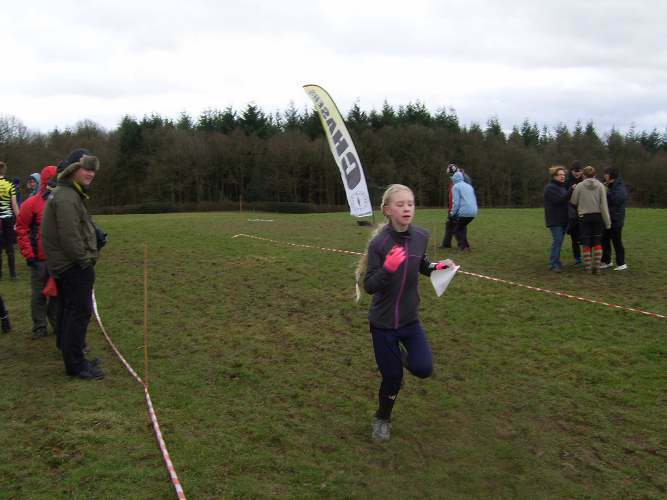 Zoe finishing on day 6 having already won her class the previous day. For full overall results click here. For daily results click here. DEE members receive the printed club newsletter roughly every two months - the current one being July 2011. We hope that previous newsletters will be of interest to those considering joining the club, as they will show you an overview of the club's activities, and the content of a typical club newsletter. 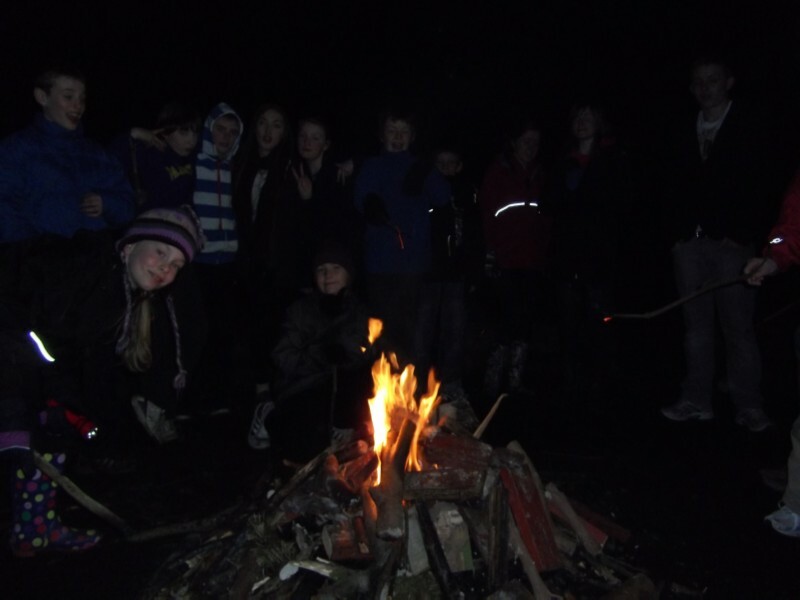 The online newsletters have been edited to remove contact details and photographs of juniors. 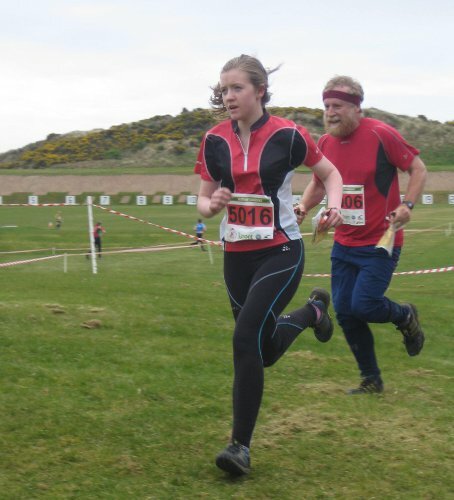 Congrats to Olly Williams and Kitty Jones, chosen to represent England and Wales respectively in the JHI's in Northern Ireland this year - so they won't be able to help at the Sandstone Trail races, but, when your country calls, you have to make sacrifices. The club's second A4 colour printer is now held by Chris Calow - contact him on 01928 722326 if you want to use it. 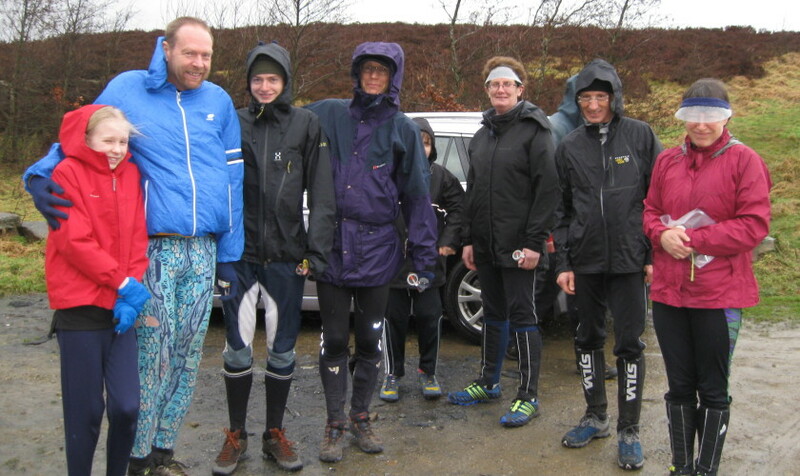 DEEluded (Mike Smithard, Jon Hateley, Sian Calow, Malcolm Irvine, Steve Ingleby) 16th in the B Relay. Plus a SHUOC team which may well have contained one or more DEE members running under their noms de course came 4th in the A Relay. 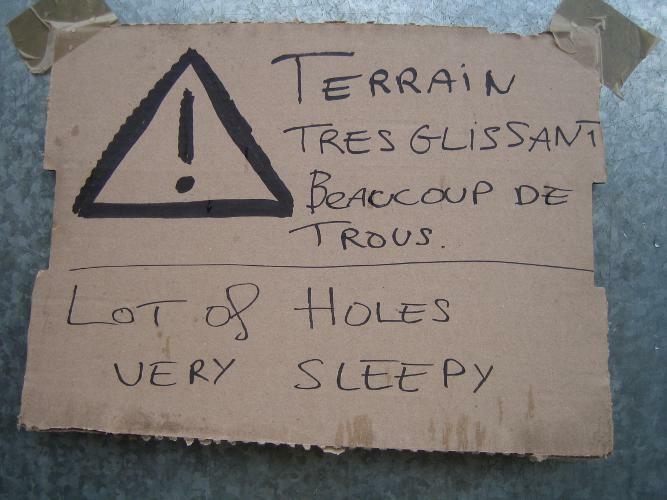 We hope to have further reports once they have woken up. Jean and Andy Payne clearly hadn't had enough after a week of the World Masters in Hungary. On the day after the finals they decided to fill in the time before their flight home by running in the Budapest City Sprint. 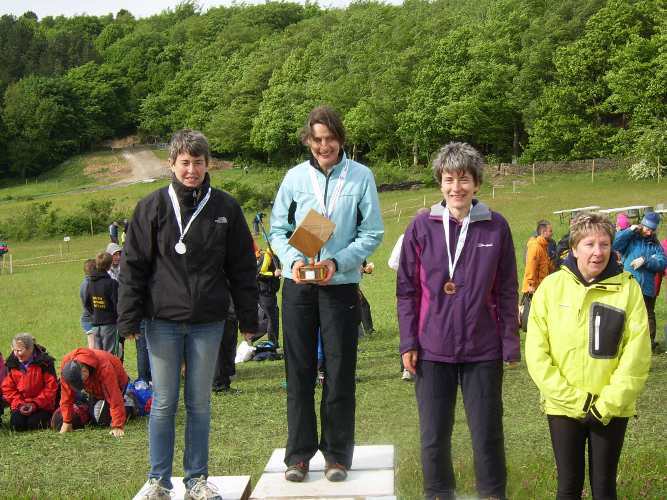 The WMOC urban events must have been good training, because Jean gained 3rd place in the W50 class, and got a medal. We have been unable to ascertain whether she brought the medal home, or ate it on the plane. 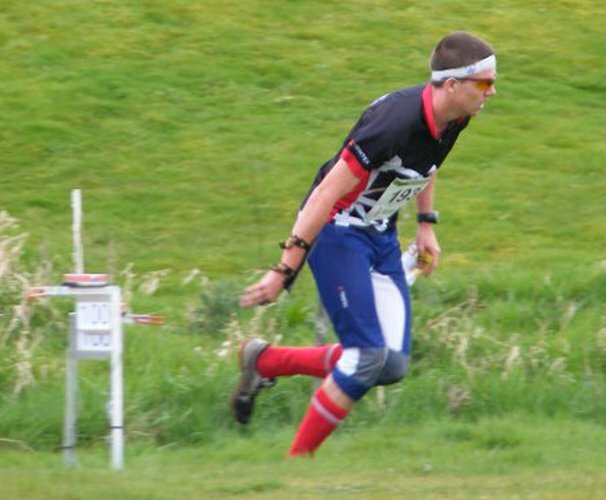 At the World Masters Orienteering Champs in Hungary, Mike Smithard won his M60 qualifying heat in the sprint race on Saturday and came in 5th in the final yesterday. He confirmed his place as British Sprint Champion by beating all other Brits in the final. Jean Payne qualified for the W55 A final and finished 53th. 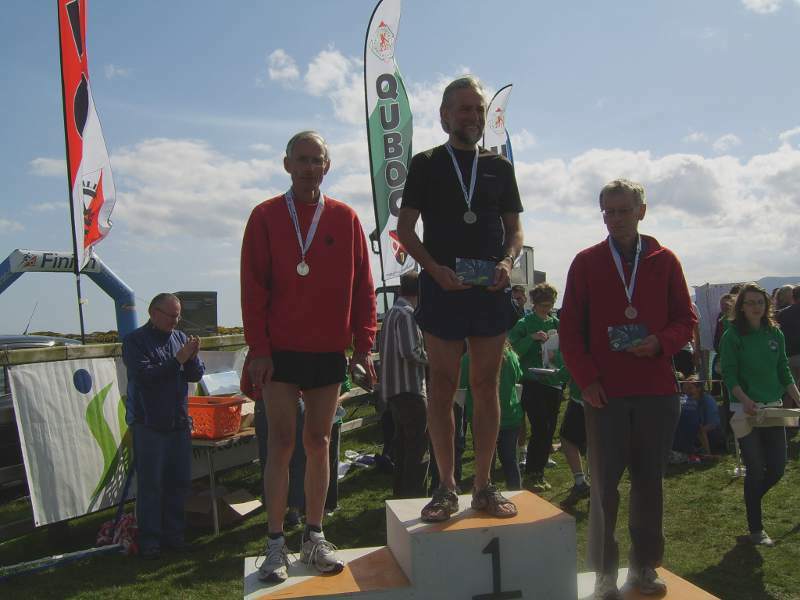 Andy Payne (M60) and Pat Moody (W50) finished 57th and 21st respectively in their B Finals while Bob Elmes came in 43rd in the M65 C Final. Meanwhile, back in the Lake District, Tom Beasant and Dave Schorah won the Kirkfell class in the Saunders Lakeland Mountain marathon in 9hr:31min:32sec, over an hour ahead of the second place team. 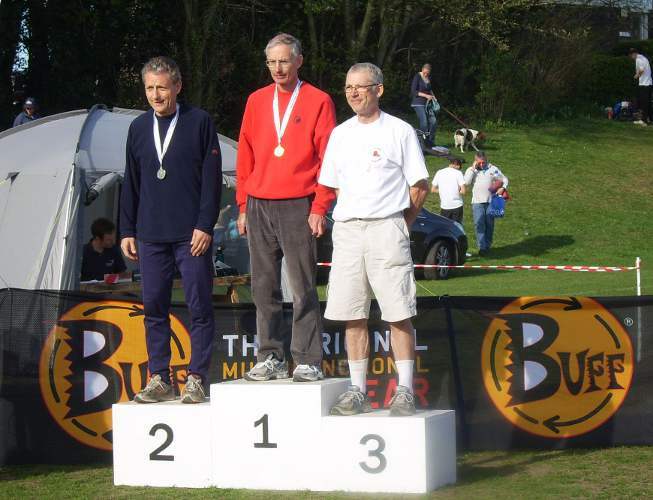 Nigel Beasant and his partner Chris Wilcox came 5th in the same class in a time of 11:54:04 and won the Veteran Men's prize. 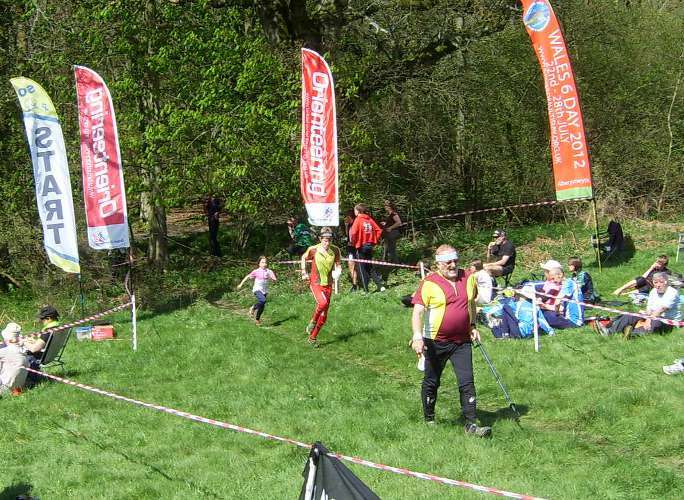 Sian Calow and Caroline Gregson competed in the Wansfell Class and finished as 7th Veteran Women (on adjusted times), 49th overall. 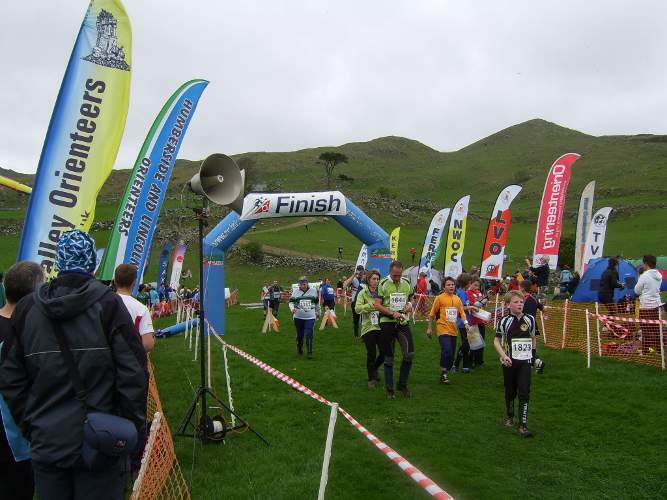 Elaine Sutton and Darren Baker, also on the Wansfell course in the Mixed Class finished 9th, 30th overall. Lots of different events going on in Horwich today - and easy to reach, just off the M61 behind Bolton Wanderers' new stadium. 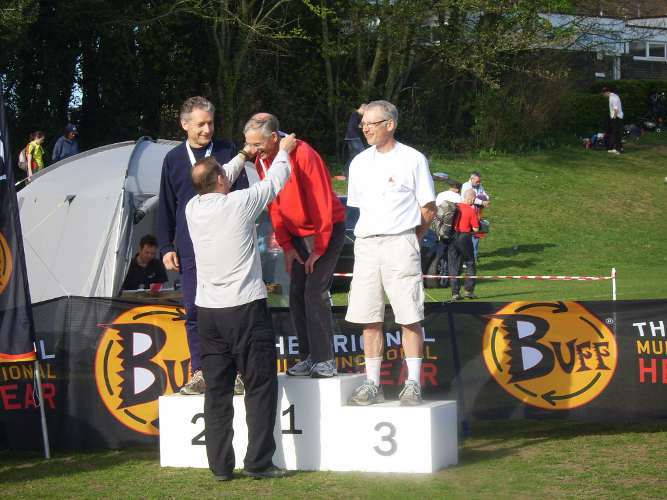 In the Emerson Group British Masters 5k Road Race, our own Peter Edwards just missed a podium placing, coming 4th in the Men 75+ class. Full race results here. 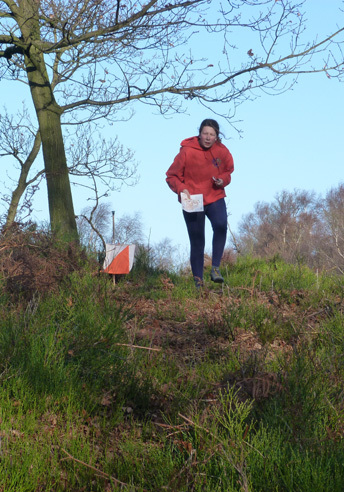 For the first time, this day included orienteering - an Urban Sprint, 30 controls including a labyrinth, planned and organised by SELOC. Several present and past DEEsiders competed, with Pat Moody leading the current members home and John Robinson, late of this parish, setting a cracking pace to win the Super Veteran Men class. 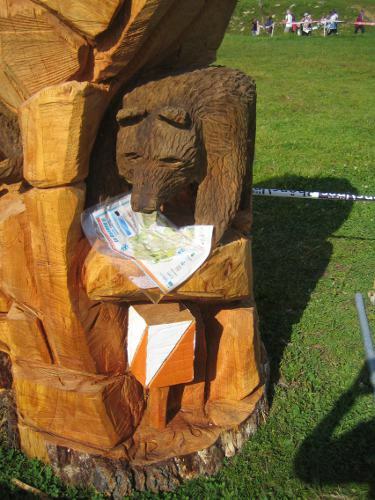 All the orienteering results here. 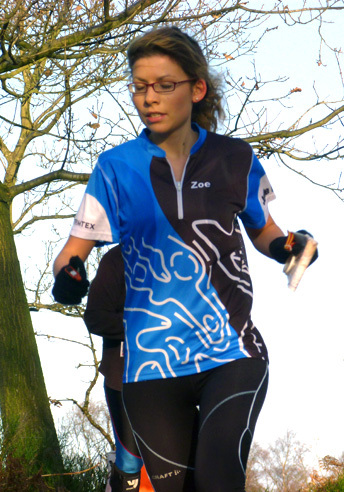 Later on, Elaine Sutton won the W40 class in the Open 5k road race in a creditable 28:00. Full results here. Alex Flynn is a man on a mission. The 39 year old lawyer from Oxfordshire is determined to run, walk, crawl, swim and/or cycle 10 million metres to raise £1 million for The Cure Parkinson's Trust. This is a huge quest for anyone, but more so for Alex as he is doing all this whilst continuing to battle, on a daily basis, the effects of the degenerative neurological condition that is Parkinson's disease on his own body. 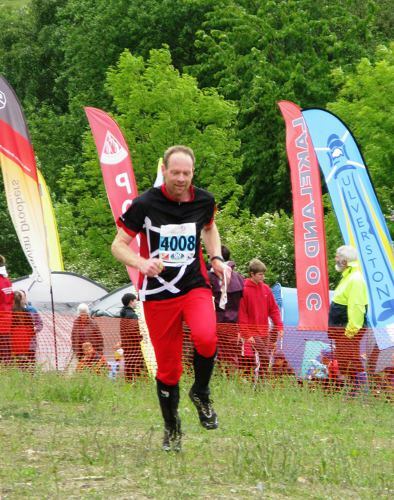 Between 10 June and the 9 July 2011, Alex and co-runner Dave Clamp (Deca-Ironman and former Team GB triathlete) will run more than 1800 miles across Europe from London to Rome (including traversing the Alps) in 30 days. The equivalent of more than two marathons a day. Every day!! 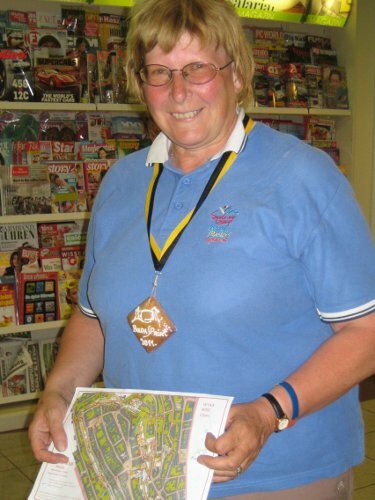 The route has been planned in meticulous detail by Deesider Jane Mockford who handed over 13 envelopes containing more than 40 maps with detailed routes highlighted. The pair left from Marble Arch, followed the Thames Path to Greenwich from where they took a route parallel to the A2 as far as the Medway Bridge at Rochester.There they joined the North Downs Way to Dover. At Calais they followed walking route GR120 up the coast past Dunkerque to the Belgian border where they joined cycle routes following canals and the river Schelde to Nieuwpoort, Bruges, Gent and Brussels. 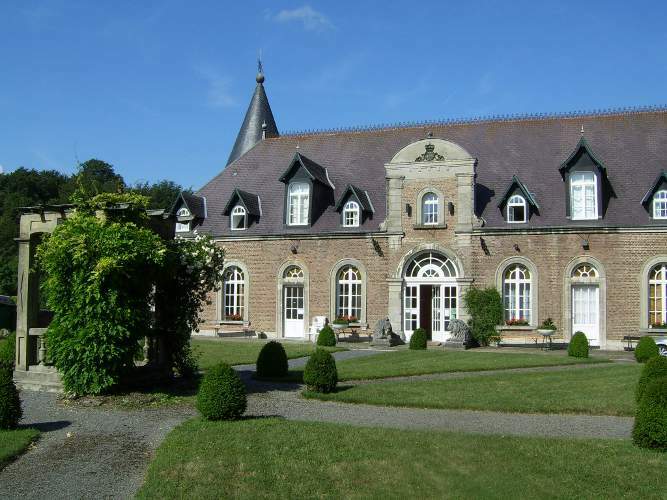 They are now making their way down the Brussels-Charleroi canal to Thuin where they pick up a disused railway track to Chimay and cross the border back into France to join the GR12 walking route to Paris passing through some wonderful orienteering forests - Compiegne, Chantilly, La Borne Blanche. From Paris they will head east to Epernay, Chalons-en-Champagne and Bar-le-Duc before turning north-east to Toul and passing south of Nancy to track the Canal du Marn au Rhin through the Vosges to Strasbourg and down the Rhine to Basle. The pair then cross Switzerland on the Via Gottardo including the St Gotthard Pass at 2114m before heading for Milan and Pavia where they join an old pilgrim route, the Via Francigena to Rome. Last weekend saw DEE members in action far and wide. Some went further than others, and some were wider than others. Les trois jours de Belgique sont dans un foret tres similar a Delamere avec moins de 'undergrowth'. Les quatre Deesiders ran tres bon avec plus de 'top 10' placings et Monsieur Smithard retourner avec un tres bon IKEA lampe pour son triumphe dans le sprint (Madame Campbell ne pense pas que il est tres bon). Le prix de food pour son deuxieme place overall had etre left behind as Monsieur Campbell had retourner au Bonn toute de suite (pour le 'climate change' conference - il n'y a pas un moment to lose). 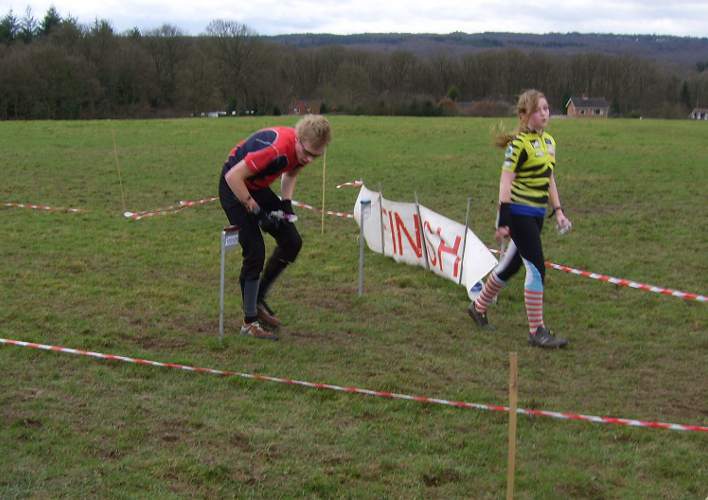 Madame Jane finished 5th overall, including 3rd in the sprint whilst Pauline was 7th on days 1 and 2 (8th overall) and Nick had an excellent 7th on day 2 and 10th in the sprint to finish 12th/48 overall. 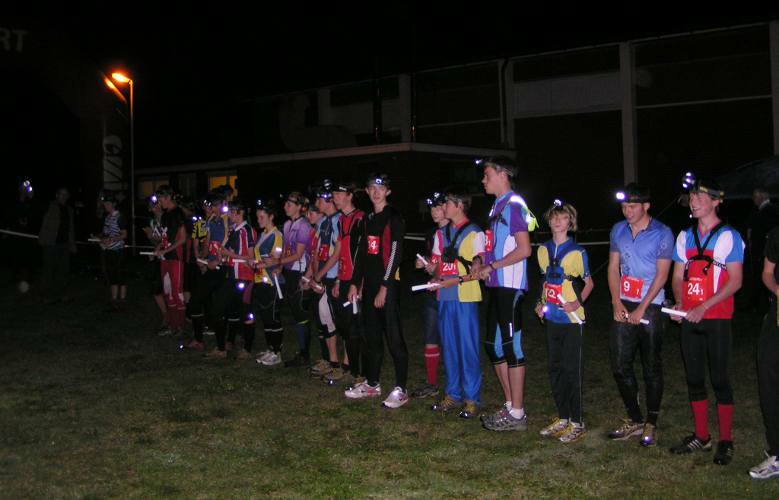 Le photo du grande B&B dans un castel pour les Deesiders est attached - les photos d'orienteering est dans Paris et peut-etre arrive en due course. All the results for the 3 Jours de Belgique here. 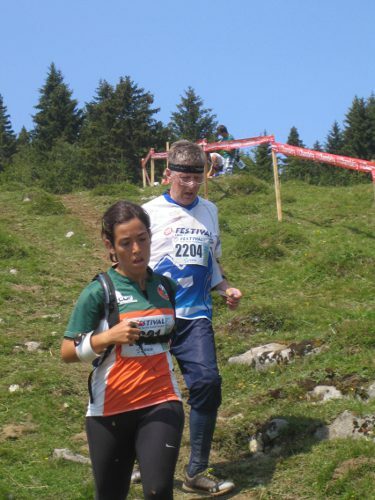 Siân Calow and Bob Elmes competed in the 30th O'bivwak mountain marathon in the Massif du Pilat south west of Lyon. Two days, 34km, 1400m climb, 32 controls. The weather was perfect. Highlights were the overnight camp with unlimited free cherries brought to your tent; a control on a col on the single rocky ridge that stood out of the forest; returning into the delightful village of Pélussin to finish; singing "Joyeux anniversaire O'bivwak" while the mayor and organisers blew out candles on the cake. In spite of walking the whole event to preserve Bob's dodgy knee, they finished 12/18 in their class, and 136/195 for their course. Practice your French on the event website here. Routegadget for the event day 1 and day 2 when Siân and Bob have remembered what they did and put their route up. Darren Baker ran in this with Emma Dyson. It may have been further away from Cheshire than Belgium is. 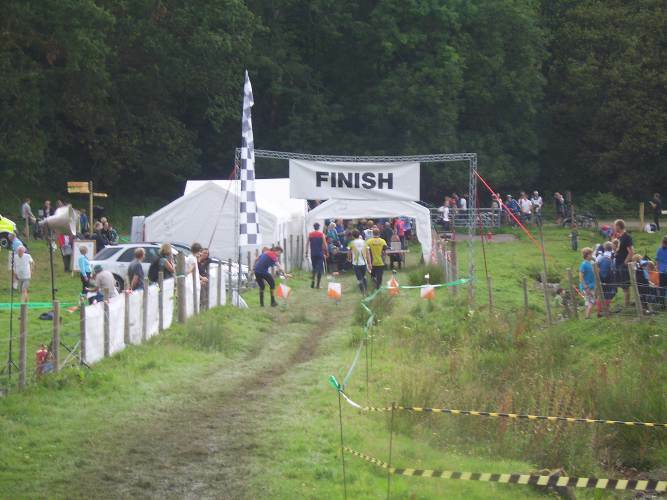 They came 75/112 on their course, and probably had more river crossings than any other DEEsiders this weekend. So far as we know, no soft fruit was delivered to the overnight camp. MDOC Town and Country, Macclesfield Forest and Macclesfield. 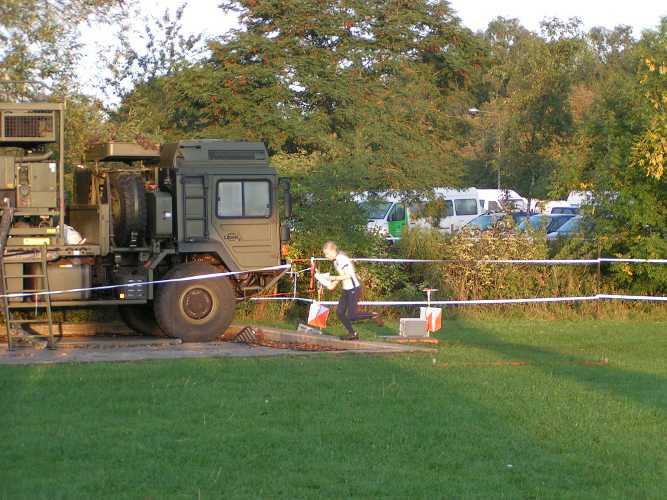 The environmentally conscious stayed in Cheshire, along with our SI control boxes (on loan to MDOC). 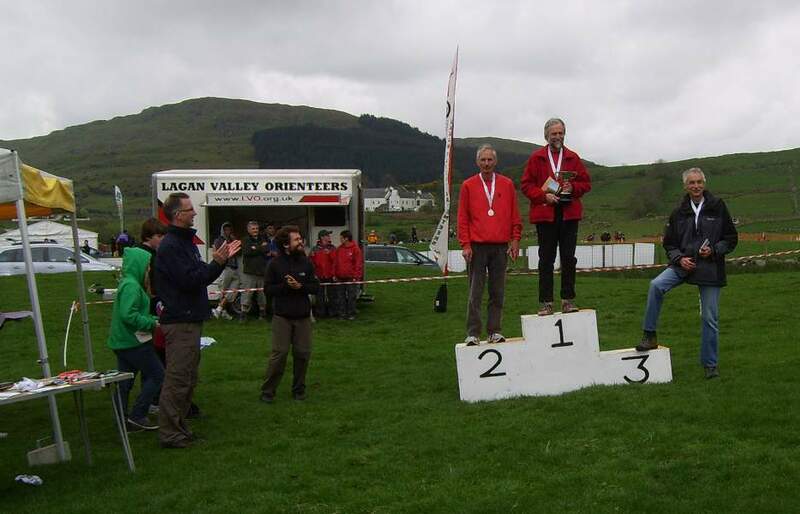 Well done to Olly Williams (2nd on Black both days), Chris Owens (4th in the Black sprint final), Paul Jones (3rd in the Green sprint final) and Hannah Hateley (1st on Orange both days). It has been remarked that there has been no news on this website for almost three weeks. Be assured that your committee are working hard on this: the coming weekend sees DEEside's finest despatched across Europe in search of drama. Expect reports next week from France (O'bivwak), Belgium (Les Trois Jours) and darkest Macclesfield (Town & Country). Our beloved chairman been at it again, winning that most coveted of prizes - two free entries to the White Rose Bracken Bashing Weekend. First half - Wharncliffe and Greno - the area with the most variation of terrain type in Britain? 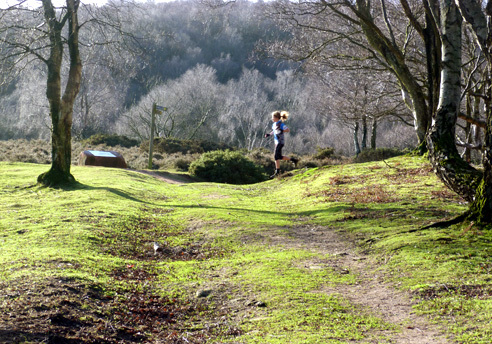 from nearly featureless smooth hillside of Greno, a thicket strewn area, commercial woodland, old mine workings and rocky slopes again in places with few identifiable features. Some long legs across valleys, indeed across valleys and ridges, then short legs in the mine workings, uphill for the last legs deduced from prior inspection and a run-in too long for Stormin' Norman and taking even Dan Hartman 52 seconds with the last 50 metres uphill - cruel. One young lady put together her best (?) 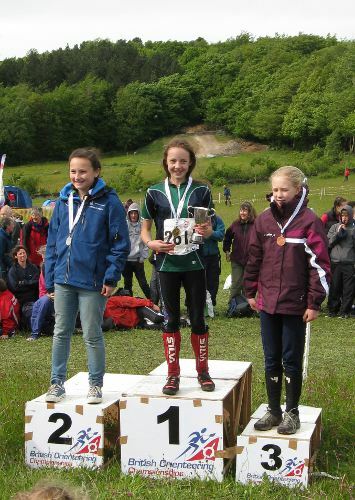 run in her new class and got a bronze medal to show for it - well done Hannah Hateley W12. 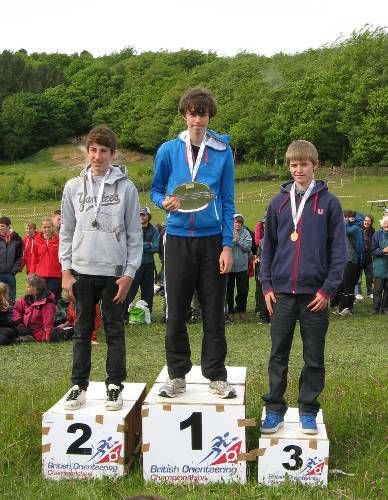 One slightly older young man regained his poise after a 'difficult' JK and also got a bronze - Olly Williams M16. 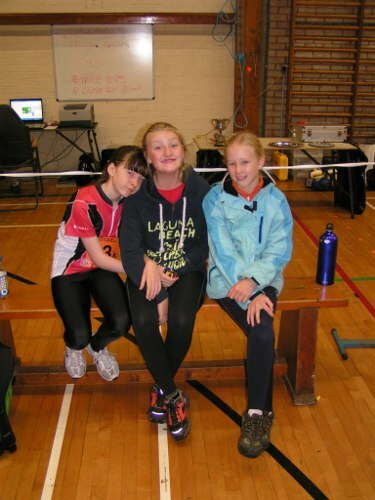 And three non-juniors also got on the podium for their 'normal'? efficient/steady/lucky/.... performances - Sarah Campbell W45, Mike Smithard M60 and Pat Spoonley W75. Not to forget Lachlan Chavasse's 4th place in M12, 20 seconds behind and Chris Owens' fine 5th place on M18E. 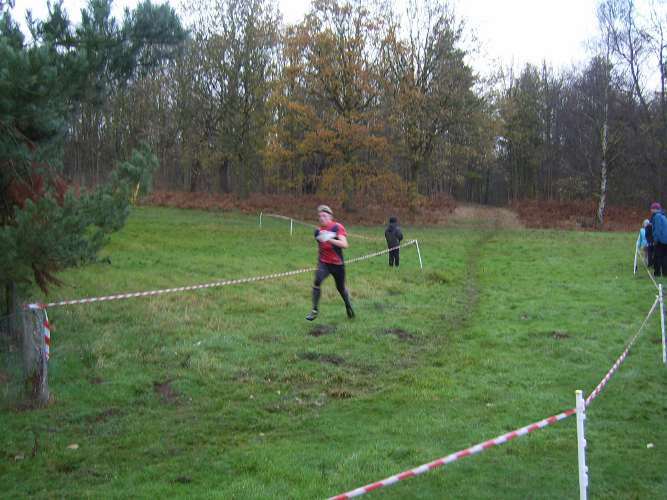 In M21E, Dave, Chris and Tom finished 12th, 15th and 26th respectively with Chris and Tom being 'inconvenienced' by one control being vandalised and hidden under leaves. Chris spotted it and replaced it but lost 2 minutes with Tom's loss being much more. Chris' real placing should therefore be 11th. As the start times were seeded, this didn't affect the top placings so the results stood with much thanks to Chris for spotting and replacing the control. Not sure if legs can be discarded in a British or whether voiding would have been the only solution. As it was relatively near the start and someone else had gone back there to report it, maybe the start would have been stopped till it had been replaced. All DEE's results are on a separate page of results here. So, no golds here but tomorrow is another day. Second half - Tankersley - little terrain variation - all old workings. Good arena setting thou a little bare underfoot. 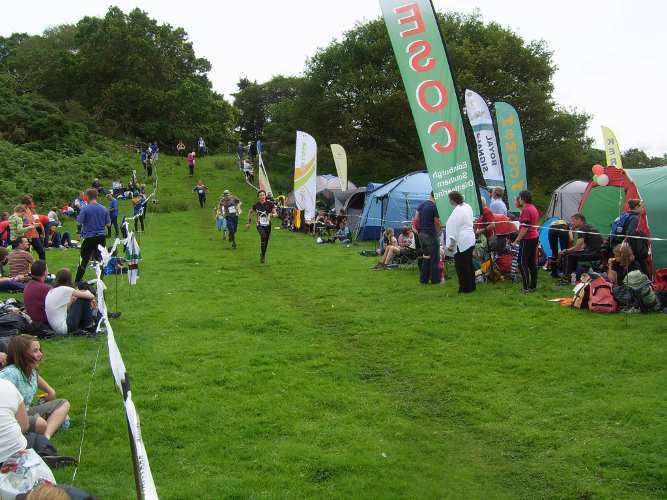 Spectator control and run through behind our tent, hillside yonder to see mini-relayers approaching finish (no rest for them in full view) and another uphill finish. 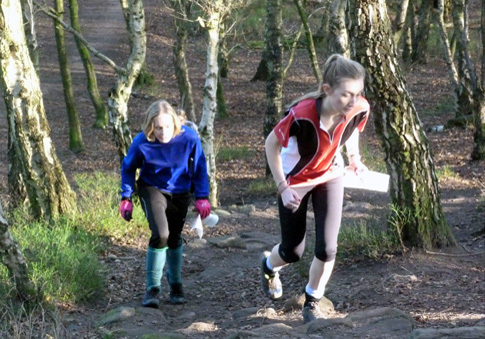 Mini-relay off first - 1.7k/leg - Hannah off first and less than 10 minutes later, they appear on the hill, with 50-100 metres between each of many runners, the first with Hannah in 6th - Dad Jon imploring her to 'run!!' 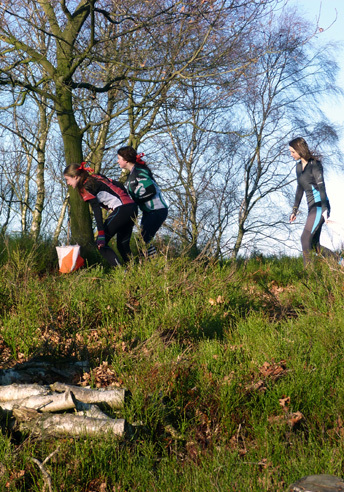 - a bit harsh up this pit heap, but Dan sets off behind 4 girls and a boy, some half his size. He takes it easy on them, taking a minute longer than Hannah but cruising up the run-in in a clear 50m lead. Lachlan, dressed in black from head to toe (full body cover required for this path run), is unleashed, no doubt inspired (threatened?) by the mad Scots lad behind him from Mar (wherever that is (Scotland)). Before you've time to say 'it's a braw bricht moonlicht nicht', a black spec appears on the horizon eventually transforming itself into Lachlan, toying with the vainly chasing Scots person. So as to be as fair to Lachlan as I am to Dan later on, his leg time was beaten or equalled by the first 4 runners on first leg, AND THEY WERE ALL GIRLS!! But as they say, on last leg, you only have to do what you have to do (to win) and no more (was I not seen walking up the first part of the run-in on last leg?). 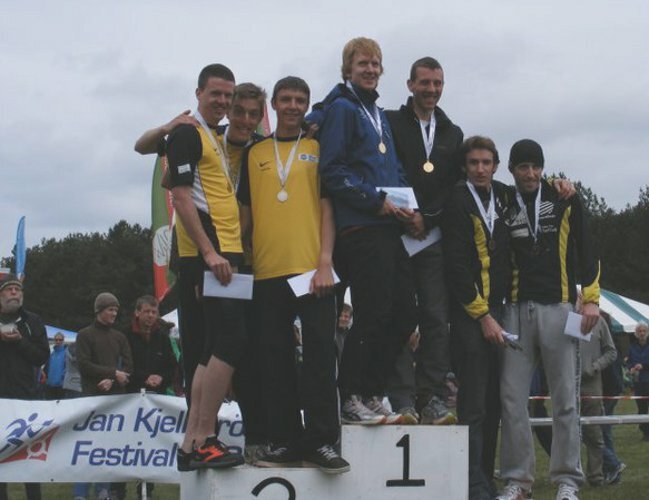 And so Deeside once more claim a junior relay gold medal (or 3) and only Dan fails to beat the min/km of the M21Elites on the Open relay but he's young and has time to improve yet. The rest of us then plodded round our courses, some of us faster than others, some better than others and then took a hundred photos of 3 minis with a drinking cup which was immediately filled from the bottle of red wine that Hannah had won earlier - good to see our youngsters taking up where us oldies have now had to leave off (on doctor's orders). 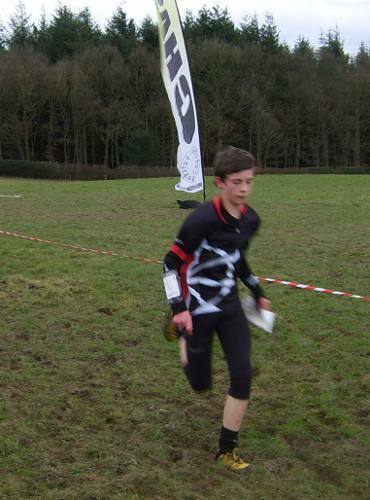 PS Three of our young men were running for SHUOC 1st, 2nd and 3rd teams. Confusingly, the first team (Who needs Graham) ran as no 5 (their 2nd team no) and their second team (We need Graham) ran as no 1 (numbers allocated as per the finishing order last year). Graham didn't run as he was injured. This is all, of course, irrelevant. Unfortunately the 3rd team (with Tom Beasant) didn't complete due to illness but Dave Schorah set off first on the 2nd leg with Chris Smithard close behind in 5th in the leading pack of 7. Much gaffling later and Dave and Chris went through the spectator control not far apart and finished 1 minute down and 30 seconds apart in 2nd and 3rd. On the last leg, the GB squaddie in the lead lost time meaning Dave's team came through to retain the trophy won last year with Chris' team slipping back a place to finish 4th. Congrats to them on two fine performances. Editor's addendum. 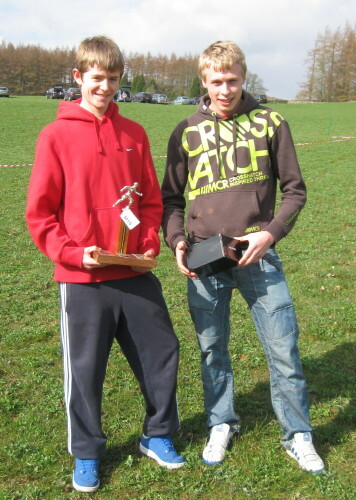 It should be noted that Lachlan and Dan, having run their own legs in the winning M/W12 relay team, went on to run, together and non-competitively, the final (green standard) leg of the Junior Ad-Hoc relay for the volDEEmort team which had lost its (W55) third leg runner promoted into another team due to the illness of their third leg runner. 'Insatiable' springs to mind. Well done and good luck to all three of them! Copy date for the next edition of Deeside News is this Sunday 8 May so all contributions gratefully received. If you send images/photos, please make sure they are in a separate file and not pasted into a word or text document. So even if you are not interested in running in the relay, there's enough other races to attract you. See the Harvester website for details. However, first CD for the relays is within 2 weeks so, if you are interested, please let me know (smithardm@btinternet.com) asap with whether you are or not interested in running a night leg. Leg lengths from 4k to 7k on the 5 leg relay, longer on the 7 leg relay. TD3 to 5. I have 4 juniors (OW, MB, CO, EC) and one senior name (PJ) I think, so far. The first Harvester was held here in 1978 when there were 84 teams in a 7 leg relay (lengths shorter than today) and there were many juniors running and no halogen headlights probably. Afraid my team from AIRE beat your team from DEE, 2nd to 7th, by 22 minutes. DEE team: Ron Williams, John Evans, Tony Thornley, John Hammond, David Williams, Chris Tanner, Terry Harper. 2nd DEE team included Jack Ramsden, Andrew Tarr, Bob Verity, Ian Roberts, John Quimby, Brian Hood and Tom Eddlestone. Less than half the normal attendance from DEE this year but three new areas to all (?) and thoroughly worthwhile in many ways. Weather chilly/warm/hot with the occasional half hearted attempt at drizzle but with light breezes only and the sun hot when it came out, a very pleasant four days. Total numbers were about normal I think with plenty of foreign visitors who scooped several prizes - including former WM champion Jorgen Martenson (who was overtaken on the second day). Deeside results? An occasional excellent performance (whatever the position), some steady runs and a few glum faces of uncomprehending 'what am I doing wrong' variety. Sprint race was round accommodation blocks and college buildings in Belfast - minute detail on maps, lots of care needed in places. 2nd day was on sand dunes but mostly depressions with a few dunes, heavy grass, gorse etc in places, very complicated on first acquaintance, lots of problems and disasters. 3rd day on open fell, fast runnable grass. Back to 2nd day's sand dune area for relays - good arena and spectator control for open classes on shooting range, SHUOC teams to the fore after 1st leg with Dave Schorah coming back first after 2nd leg but John Rocke overhauled by GB team member Murray Strain on last leg to take trophy. 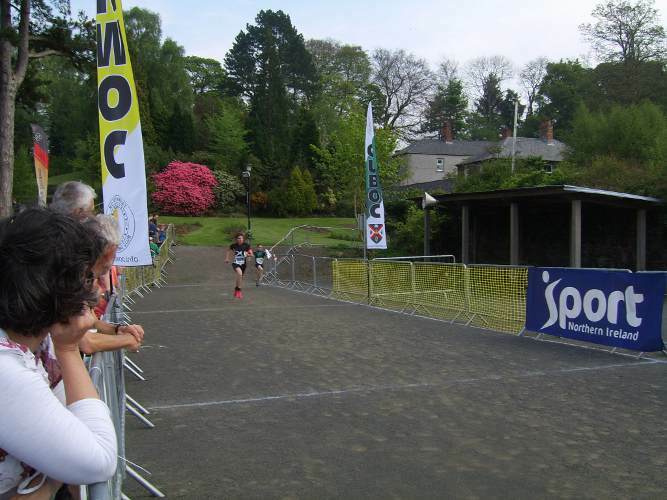 W55S Pauline Smithard 3rd/4th for 3rd - not bad 3 weeks after knee op - did she run? Don't know but she didn't use any sticks. M165+ Mal Irvine, Noel Schorah and Mike Smithard 10th overall, Noel was 2nd fastest on the 2nd leg pulling up 12 places, pity Mal and Mike messed around at their first controls. M48- Olly Williams, Lachlan Chavasse and Chris Owens 5th - first (proper?) 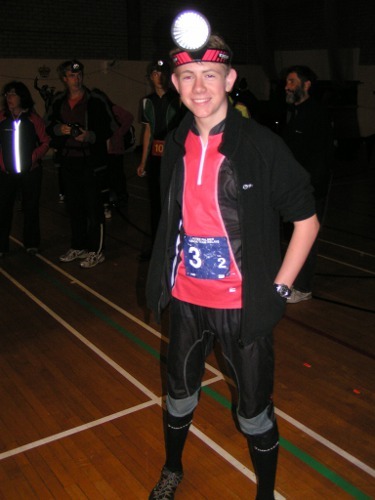 relay for Lachlan - he was puzzled as to how he was expected to go round when the map was in a brown paper bag. 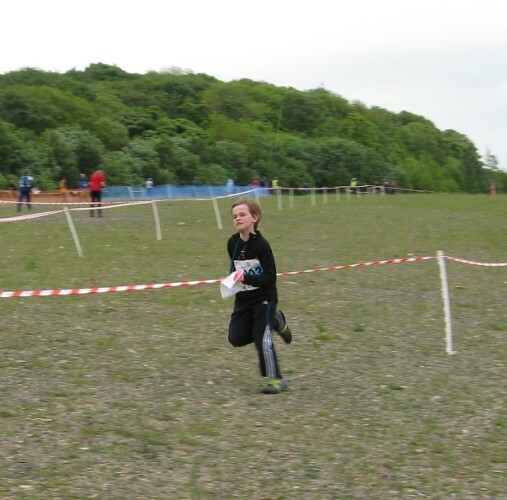 Not far from leading group but Lachlan was a bit younger than other runners. Unfortunately a mistake has occurred in the calculations of points after the final event of the season at Marbury. 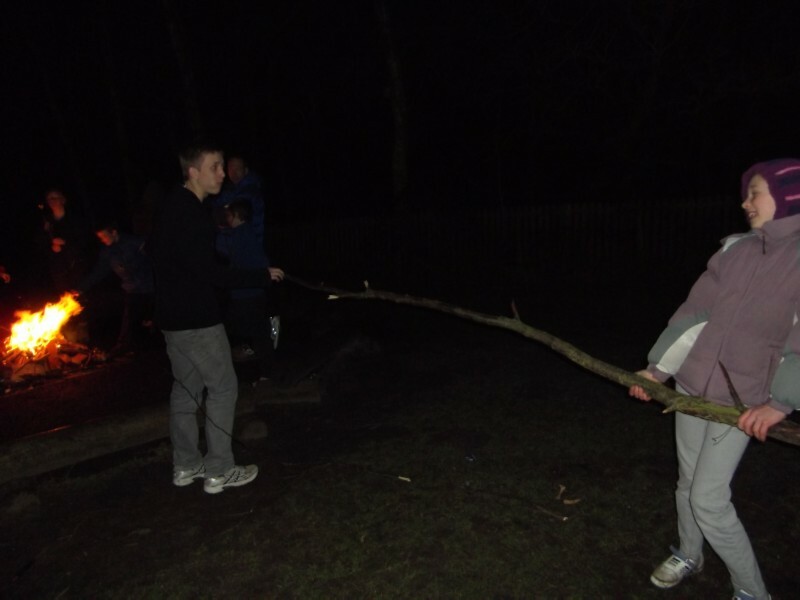 This resulted in everyone who completed a course at Eastham being credited with maximum points for the Eastham Event. We are very sorry this occurred, that it has taken so long to spot the error and to correct it. The Schools League and Individual Rankings have now been re-calculated and re-published. Fortunatley, not all of the Individual Rankings were affected by the error. Unfortunately, some were affected and in particular the top three places in several closely fought Individual Ranking Groups. We are very sorry this happened and urge any and all interested parties to look again at the Schools League and Individual Rankings final results. 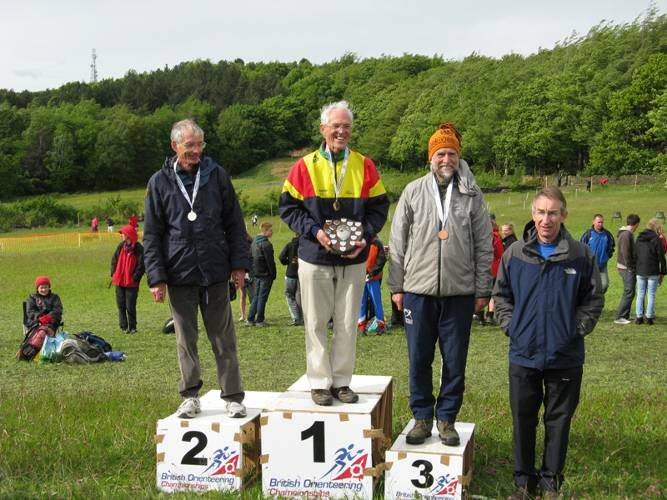 Congratulations to Mike Smithard on becoming M60 British Sprint Champion, winning the A Final ahead of John Britton (MDOC) and Richard Payne (EPOC). Earlier there was drama when Nigel Beasant performed that most embarrassing of manoeuvres - getting within a few metres of the last control and then having a panic moment of not being sure of where he was with several hundred people watching. A slowly performed pirouette covering 10 metres whilst examining his map (which was basically a blank playing field, so not a lot of use) used up vital seconds, disastrously dropping him from qualifying for the A final - but he rose to the challenge and won the 'B' M50 final - a much more noteworthy achievement. The photo below shows him successfully punching the last control in the heat. Tom Beasant, in his Elite heat, was just one place outside the top 6 who qualified for the 'A' Elite final. 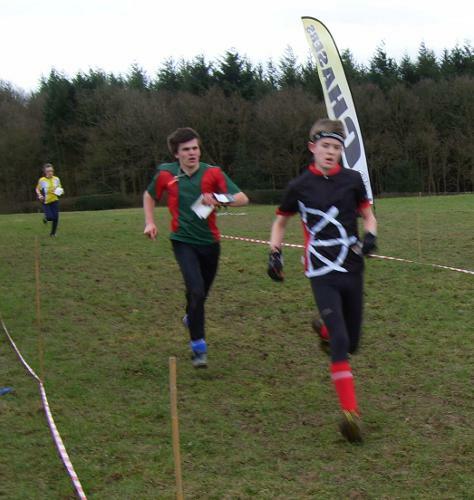 In the Middle Distance Championships on Sunday, Olly Williams got the best DEE placing with 4th in M16. 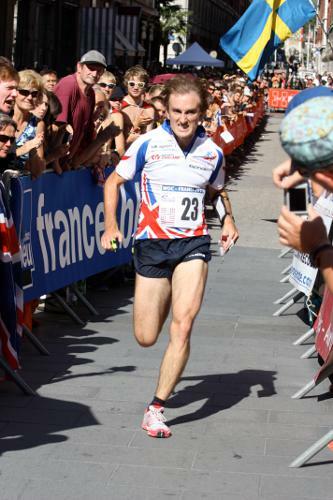 Chris Smithard, on his 22nd birthday and just back into training after 8 weeks out with injury and illness said he was hoping to get back to 'some sort of fitness' for the JK: so he finished 19th in Men's Elite, 6.2k in just under 35 minutes - 4.5 mins down on Graham Gristwood. Most of us would think that that was already 'some sort of fitness'! 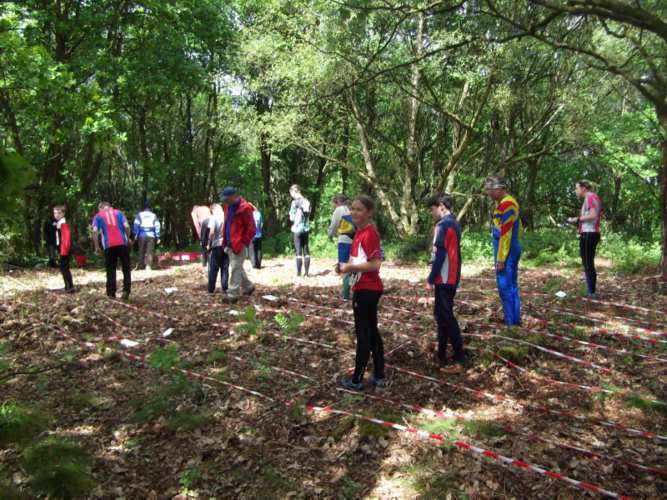 Four primary schools in the Chester area took part in an orienteering competition at Chester County Sports Club organised by Upton High School School Sports Co-ordinator Jodie Green with the help of Deeside members Jane Mockford and Mike Smithard. 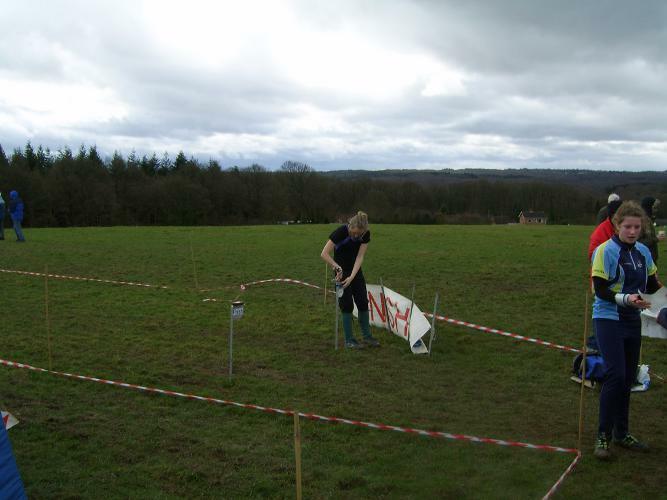 Teams of six competitors from Acresfield and Mill View Schools from Upton, St Oswald's School from Mollington and Mickle Trafford School completed a classic course of 1.7k, 17 controls as individuals or in pairs. Teams of three from each school then took on head to head racing from a mass start in the Team Score Challenge splitting the 26 controls between the team members. The Classic Course was won by Mill View but a strong performance by both Mickle Trafford Teams to take first and second place in the Score Challenge secured their school the overall win. 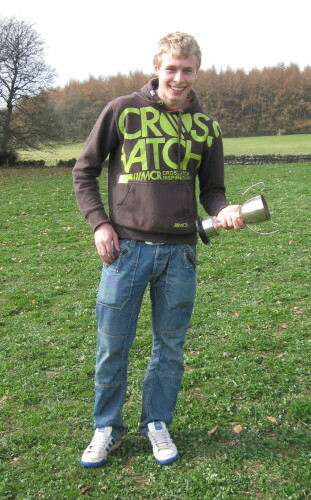 Congratulations to Jac Goodall from Mickle Trafford who won the 1.7k Classic Course in a time of 10min 41 sec. 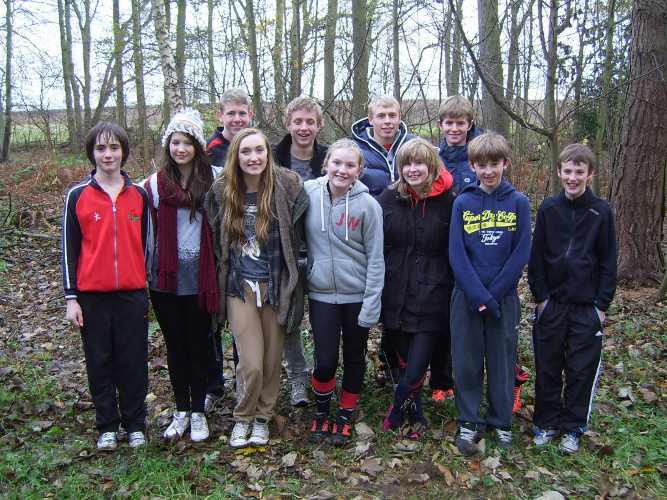 Very well done to all these budding orienteers and we look forward to seeing them at one of our events soon. 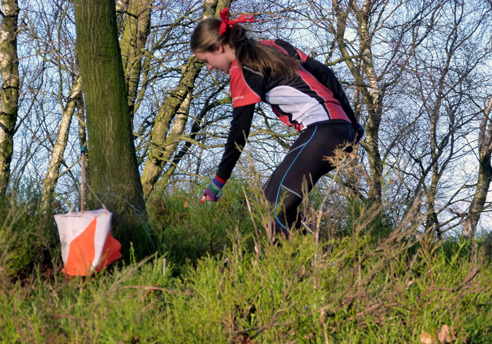 In keeping with the policy of introducing more competitions into orienteering, you can now follow our position in the Orienteering Uploading League. We are happy to report that DEE are 3rd in the national rankings, and 1st NW club, with a maximum 2800 points from two events. In an effort to improve our ranking further, Results Secretary Bob Elmes has applied for funding to attend a National Uploading Squad weekend. 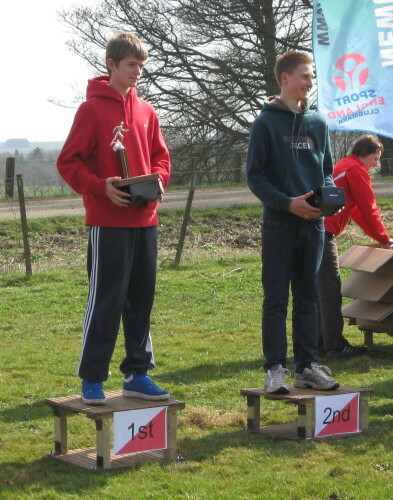 Congratulations to Olly Williams M16 and Chris Owens M18 on their victories in the Northern Championships at Ray Demesne, Kirkwhelpington, Northumberland yesterday. The key result of the day however was on the M50L course where the DEE chairman beat the MDOC chairman in a tight race for 19th place (out of 23). See the championship results and the full weekend results. The training area at Halkyn is currently being grazed by sheep in lamb, and the planned event on 2 April would be likely to cause disturbance to them. We have therefore decided to cancel the event. DEE members receive the printed club newsletter roughly every two months - the next one being March 2011. We hope that previous newsletters will be of interest to those considering joining the club, as they will show you an overview of the club's activities, and the content of a typical club newsletter. 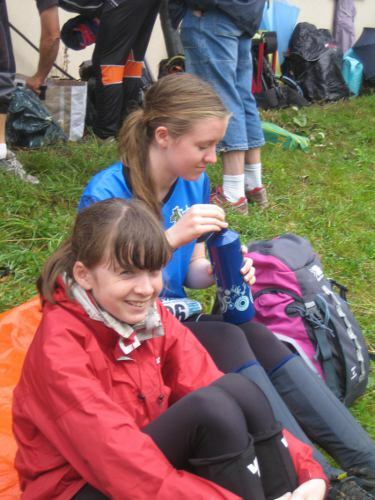 The online newsletters have been edited to remove, for example, captioned photographs of juniors which it would be contrary to club and British Orienteering policy to show on the web. Please be patient while the newsletters load - they are big files. The copy date for Deeside News is Friday 11 March. Please send text in Arial font 11 (which saves Jane having to reformat everything) and images in separate files to Jane Mockford (deesidenews@yahoo.com) . Thank you to Mike Smithard for coordinating the successful Junior Training weekend and to all those who helped in various essential roles from cooking to coaching. 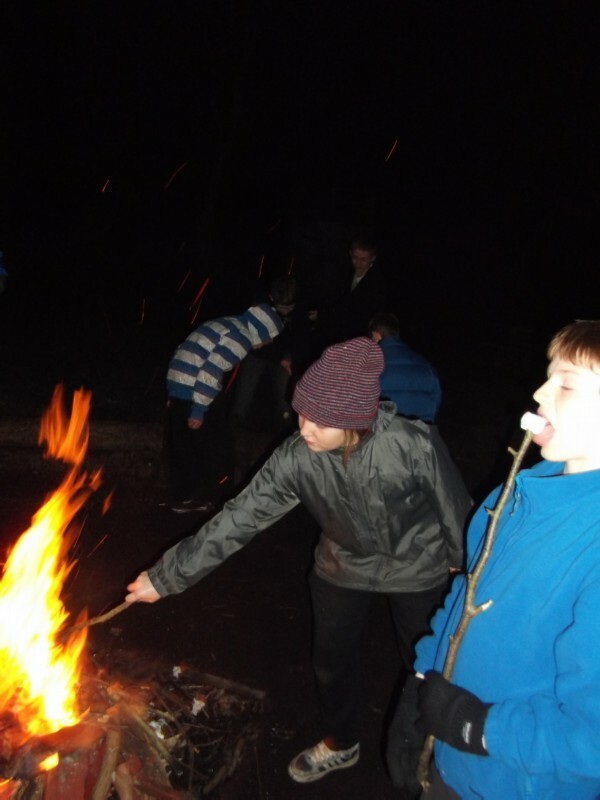 Editor's comments: The juniors clearly learnt a lot - some of them didn't need to go to school on Monday. Well done to Sara Campbell (4th W40), Olly Williams (2nd M17) & Dave Schorah (6th M21) for playing their part in helping the England Team achieve victory in the Interland race in Lübeck, Germany today. Interland is a six-sided international between England, two Belgian teams (Flemish and French speaking), the Netherlands, the Nordrhein-Westfalische (NW Germany) team and a French team from LNPCCO. Some members of Deeside may remember a one time fellow Deesider called Jean Ramsden. Jean ran for G.B. as a 16 year old, and is the daughter of the late Jack (a former DEE Chairman) and Barbara Ramsden. Jean and family now live in Christchurch, New Zealand. It is with great relief that we are able to report that despite the recent tragic events in Christchurch, Jean and her family are safe. The Environment Secretary Caroline Spelman today announced that the government will halt the current consultation on the future of forestry, and will remove all the forestry clauses from the Public Bodies Bill. 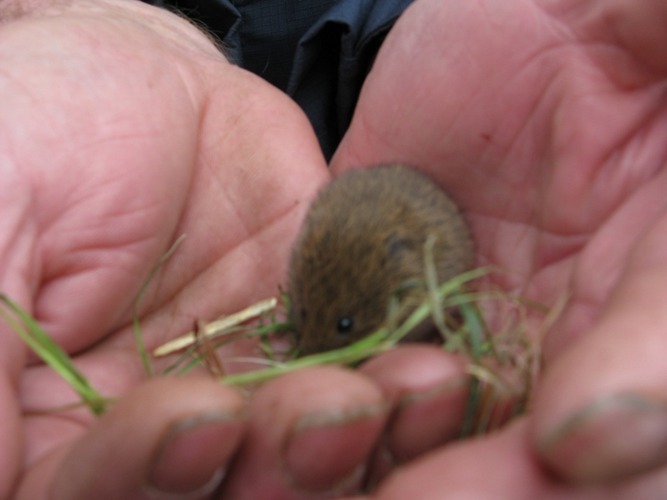 See the DEFRA statement about the changes and future intentions. As an experiment, we are making edited versions of previous club newsletters - Deeside News - available online. The first newsletter to be made available in this way is number 249 for November 2010. DEE members receive the printed club newsletter roughly every two months - the most recent one was in January 2011. We hope that this previous newsletter will be of interest to those considering joining the club, as it will show you an overview of the club's activities, and the content of a typical club newsletter. 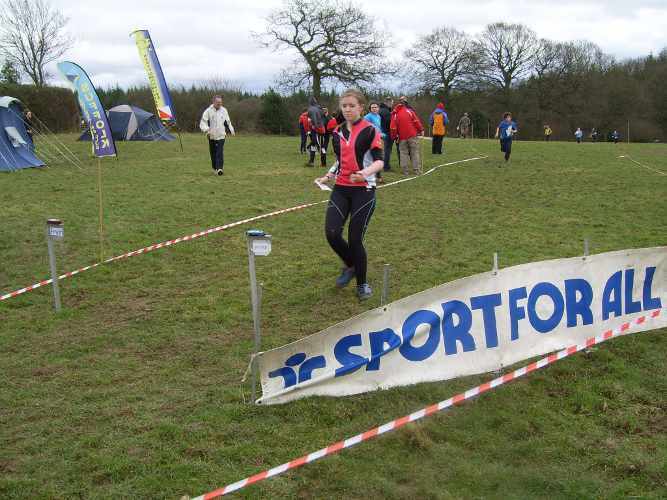 The newsletter has been edited to remove, for example, captioned photographs of juniors which it would be contrary to club and British Orienteering policy to show on the web. Deeside News 249 November 2011. Please be patient while the newsletter loads - it's a big file. Mike has not yet entered the relay teams. He already has the names from the lists that you filled in at the Turkey Trot. If you didn't put your name on those lists and you want to run, please let Mike Smithard (smithardm@btinternet.com) know asap. Members will be aware of the pulic debate on, and the widespread opposition to, the proposals contained in the Public Bodies Bill currently before parliament. The committe has asked Tim Palmer to lead the preparation of the Club's input to the public consultation process on the Bill - watch this space for Tim's request for members' input to the Club's position. In the meantime, members may wish to express their individual views directly via the various means available to them: the following notes by Barry Barnes provide some links which members may find helpful. Opposition to government proposals to dispose of the forestry estate is being expressed through websites, action groups and attendance at council and other meetings. The club will prepare a statement on its position in relation to the intended sale of Delamere Forest but individually we can make our views known through these various forums; many of us have already got into correspondence with our MPs. The vehicle for the sell off is the Public Bodies Bill presently going through Parliament which if passed will empower Ministers to dispose of public assets without recourse to Parliament or the public; the House of Lords Constitution Committee is expressing grave doubts about the legitimacy of the bill, but nevertheless it is well on its way through both Houses. http://www.38degrees.org.uk/page/s/save-our-forests#petition for the national situation and a petition. Average attendance was 46, and there was no event with fewer than 35 competitors. 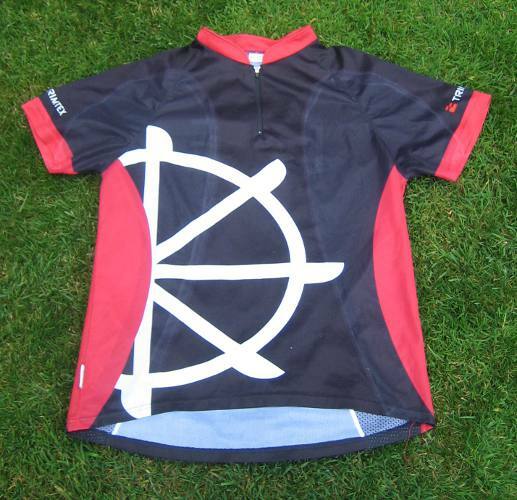 Five years ago no event reached 30, so this esoteric branch of the sport is in danger of going mainstream. Seriously, it's great fun and sharpens up your navigation no end so, if you haven't tried it yet, do give it a go next season. Congratulations to our juniors for turning in a great performance in the YBT Final to finish close behind 3rd place out of 14 teams. Missing 5 of our juniors from our original team for December, two lads from Sandbach School joined us and counted in our top 9 placed runners. Thanks to them for coming in at the last moment. 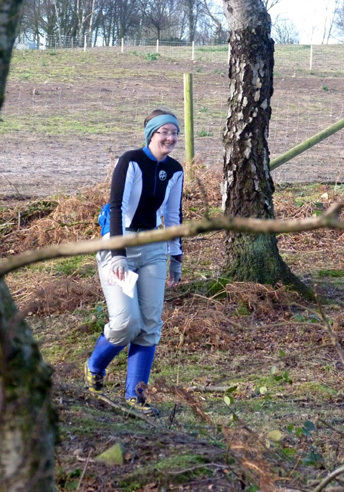 With OD as expected running away again with the top place, DEE finished behind Lakeland and SARUM in 4th place. Heavily weighted in numbers on the green and yellow courses, we had 4 counters on both courses (the max allowed) with 2 on orange (2 tied in 9th place). Counters were: Matthew Vokes, Mike Beasant and Chris and Eleanor Owens on green, Sean Pickering and Kitty Jones on orange and Dan Weaver, James Parker-Aiken, Sam Baldwin and Hannah Hateley on yellow. 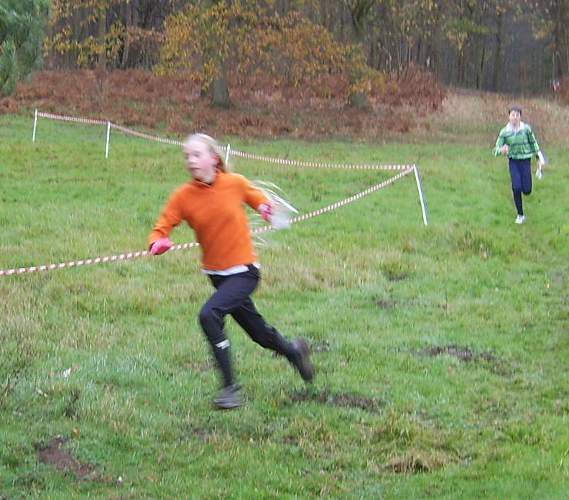 Thanks to the other 11 juniors who ran, no-one knows who will count till afterwards - and next year (or is it this?) could be your year. Whilst we had the wind, we didn't get any rain - for which we were truly grateful, up on an exposed hilltop, and the temperature was an almost non- chilling 10 degrees. Full results, Winsplits, Routegadget etc. on the HOC website. Rob Lines' photos of the event. Men's refusal to stop and ask for directions...is a perfect example of [their] tendency to put up a front, in that it views as aberrant a condition - being lost - that is ineluctable, a given of human existence. We are born lost and spend vast stretches of our lives on wrong turns and backtracking. Michael Chabon, 'Manhood for Amateurs'. 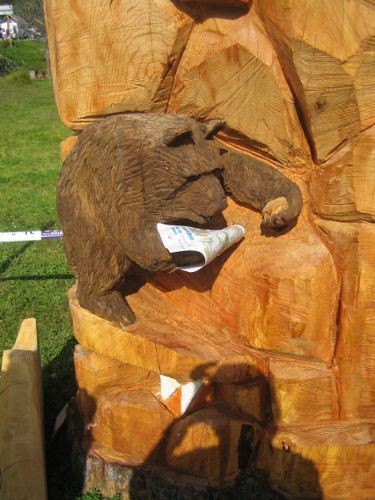 Whilst the first individual entry date for JK is end of January, the first relay date is early March whereas British relay entry date is late February, a week after the individual date. I have the list of names from the Turkey Trot (27 for BOC and 15 for JK) which I will re-check nearer the time but, if you didn't sign it, please let me know by February 18th for both competitions so I can formulate teams and check with people about options. I didn't order snow on the hills but not on the roads this year, and see where it got us!! An experience, but not one to be repeated too often. Thanks to Sonia and helper for the new games etc., the hostel and everyone's dormitory (?) were spacious (thou we didn't exactly fill it) and the building interesting. Once again, Meg got the 'interesting' room. Thinking that people have left things behind at the YH and bringing them away with us is sometimes not always the right thing but, with fairly good omens, Jon Hateley has a pair of O shoes left in the lobby and Liz Jackson a black cap with small peak from the drying room. Any offers to them. I have relay maps so if anyone didn't get a chance to reclaim the remnants of their or any map and would like one, let me know, otherwise they will be binned by next w/e. A pristine map of the area is on the Aire website, under permananent courses if that would look better - but not such a reminder. Thanks to Pete Owens for these photographs of members enjoying some Yorkshire weather. Editor's note:It's Thursday now, and I have been washing and drying kit continuously since the weekend. I expect I'll be finished just in time for the next one. It was with great sadness that we learned of the tragic death of Marbury Ranger Pete Schofield, after an accident at the climbing wall in Stockport on December 27th. 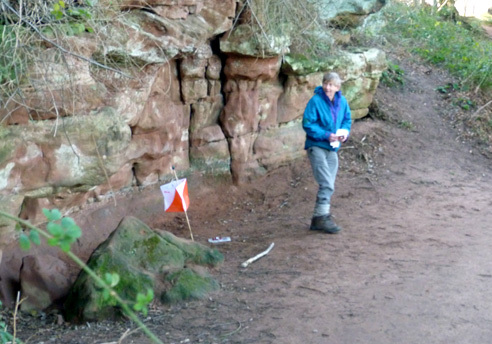 From the moment that permission was given for a permanent course in Marbury Country Park at Comberbach, Pete supported us with enthusiasm. It was Pete who masterminded the making and painting of the posts, digging the holes and installing the 26 controls and starter post. 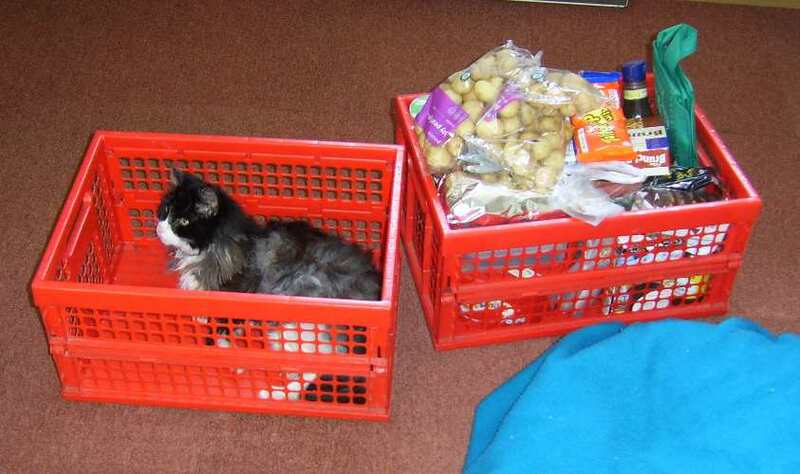 Nothing was ever too much trouble for Pete. 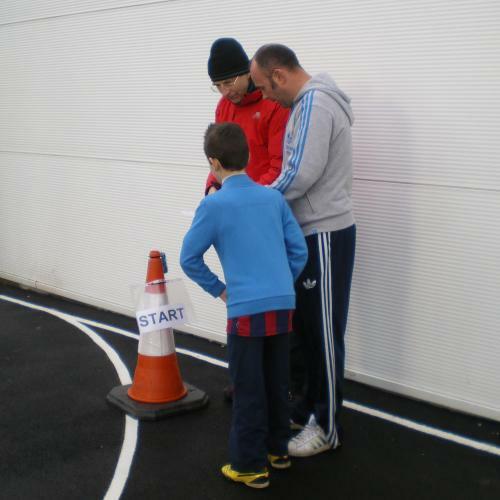 He ran courses for beginners and encouraged wheelchair users to explore the park. 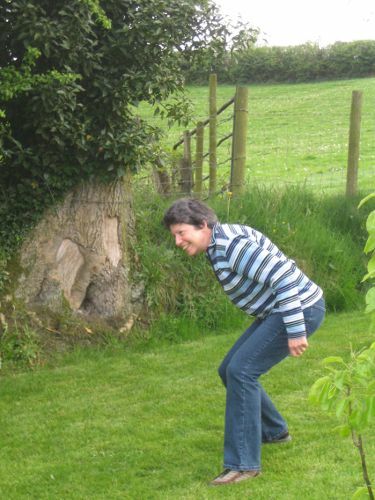 The course at Marbury has always been maintained and updated for the Club, and its success has been in no small way due to Pete's ever smiling cooperation. He was a lovely man, and we shall miss him. Our heartfelt sympathy goes out to Pete's widow Lynn and daughter Amber. Pete's funeral will be held at St.Luke's Church, Holmes Chapel, on Tuesday 25th January 2011 at 10:30AM. 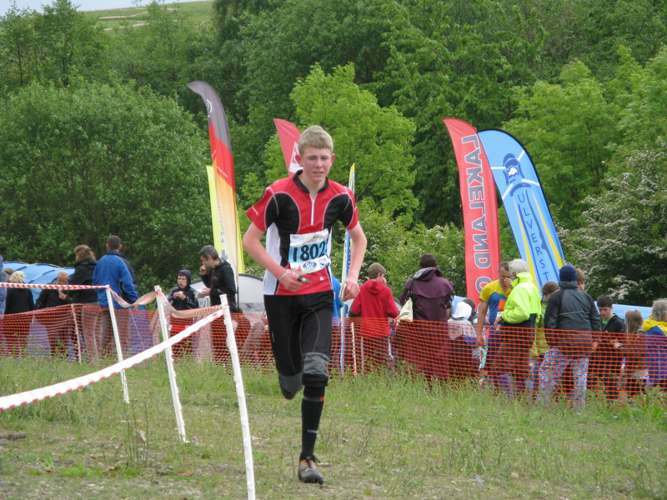 DEEsider Tom Beasant, running in ShUOC colours, won the Rab Mini Mountain Marathon on Sunday. 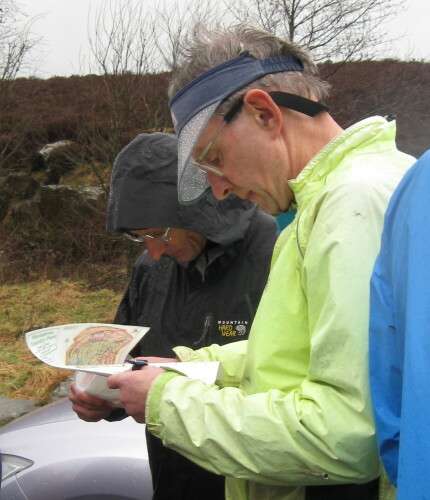 Starting from Hayfield, and taking in the Kinder Scout edges above Kinder reservoir as well as other hills around the town, this was a 3-hour score event run under FRA rules. 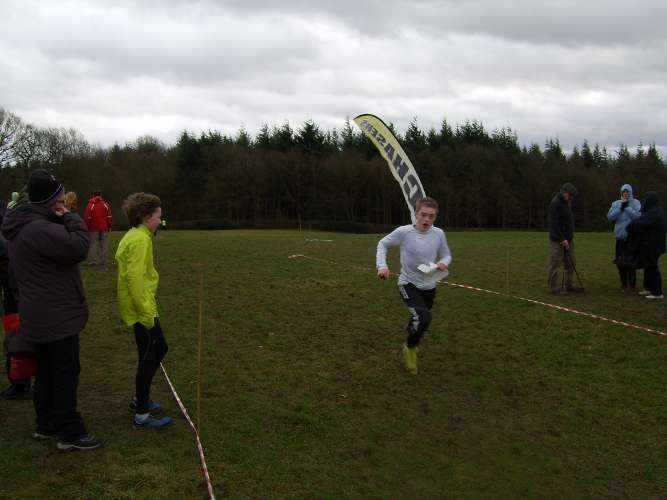 Tom bagged all but one of the 23 controls, finishing in first position and 54 points ahead of the second-placed runner. He made optimal use of the 3 hours, incurring only a 1-point penalty for finishing 39 seconds over time. Father Nigel also had a good run, finishing 14th. You can see the full results, and details of more events in this format, on the Dark & White website. These are awarded to highest placed M/W in BOF rankings. For more about the Twin Peak weekend click here. 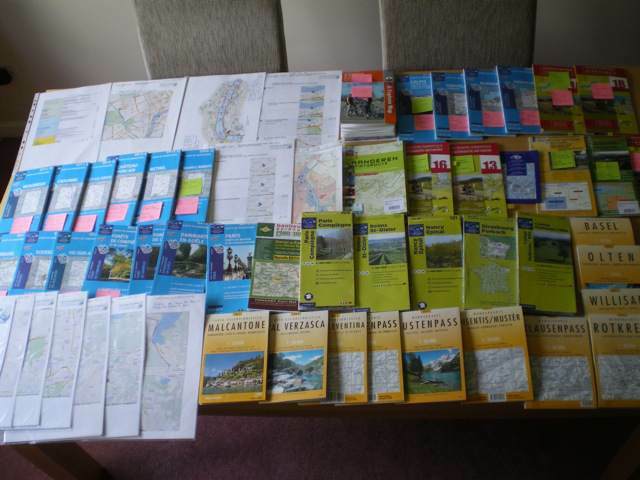 Both of these venues are near Coniston, so the club has booked our favourite Lake District accommodation at Lanehead. 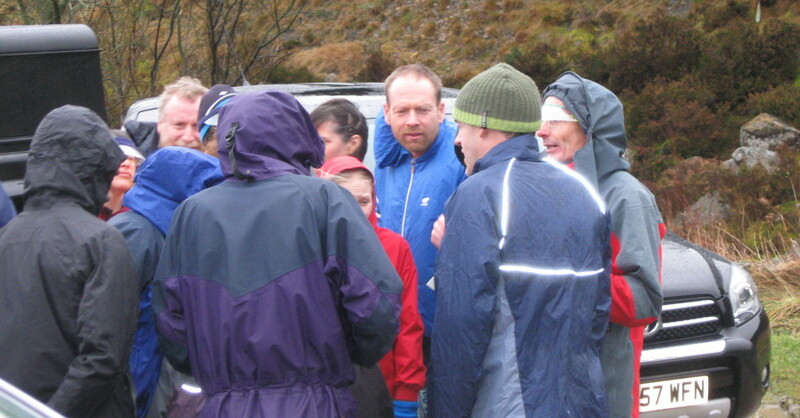 The 37 club members who stayed there for the Lakes 5 Day 2010 will tell you how comfortable and well-equipped it is. We've booked Lanehead for the Friday and Saturday nights. The cost, for accommodation only, will be £32 per person. Sorry, no reduction if staying only one night. Friday dinner - no group arrangements - eat at home, or on the way, or cook for yourselves when you arrive. 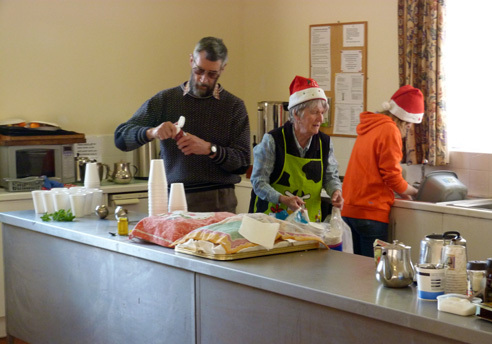 Saturday and Sunday breakfasts - cereals, bread, milk, jams etc. will be available. Saturday dinner - by popular demand, the return of the DEElicious group dinner, with vegetarian option, cooked by DEE volunteers. This worked very well at the Lakes 5 Day. We will share out the cost of the ingredients among all those taking the meals. When we did this in the summer, people had difficulty believing how cheap it all was. 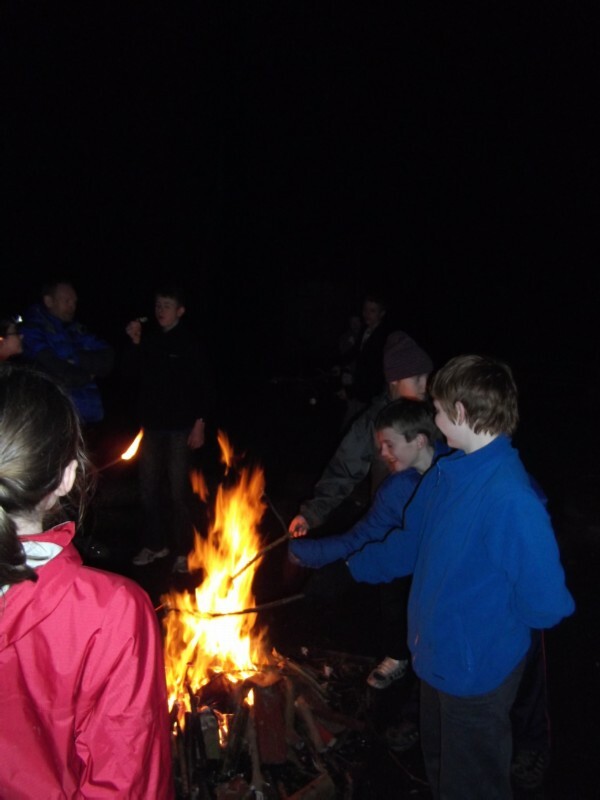 For more details about the accommodation at Lanehead, see the Lakes 5 Day News Item. The available spaces at Lanehead are fully booked. There may be spaces available if anyone cancels; or we may be able to book people into another club's accommodation, though we won't know about this until the end of January. If you want to put your name on a waiting list for any available spaces, please contact Bob Elmes (dee@elmes.demon.co.uk) tel. 01928 731946. 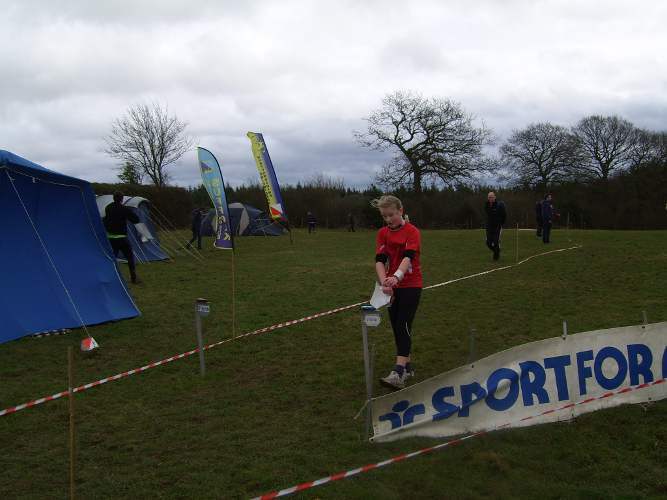 © 2011, Deeside Orienteering Club.